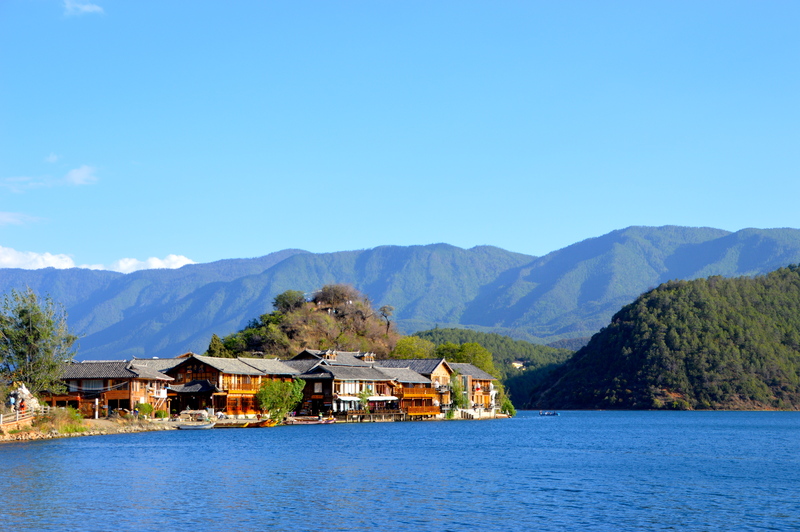 This part of the journey took us from ancient Lijiang through forest and mountains up to the high altitude lake of Lugu on the remote Yunnan/Sichuan border. It remains imprinted on my memory as a time of solitude, surrounded by high peaks, firs and Spanish moss. 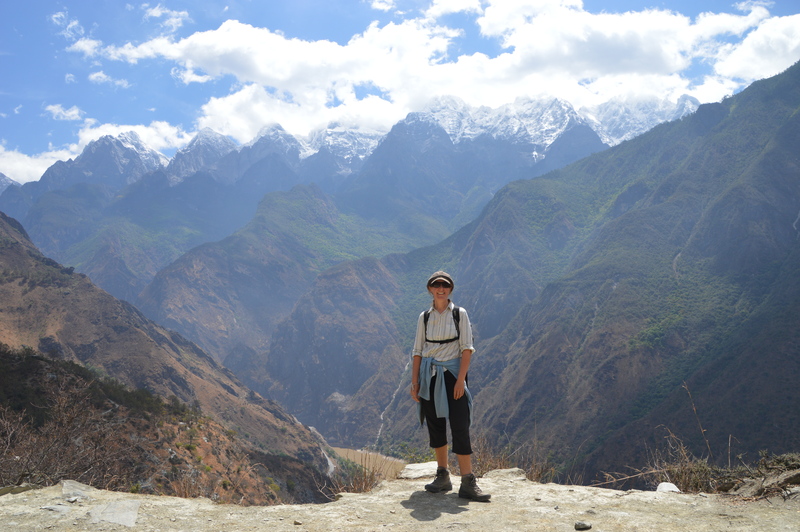 Of icy thin air, breathlessness, and seemingly endless sweeping views of mountains and blue sky. 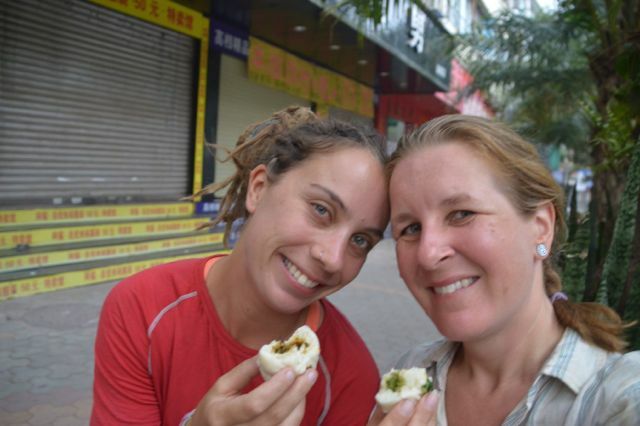 It started like most of our days start, with delicious steam buns and noodle soup. 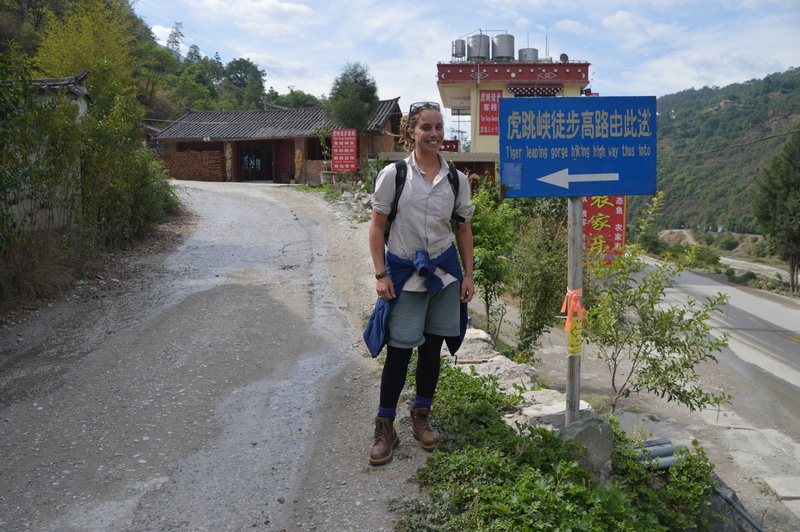 This was followed up by shopping at the market for supplies, before heading off towards Lugu Lake, about 200km away according to the signs. 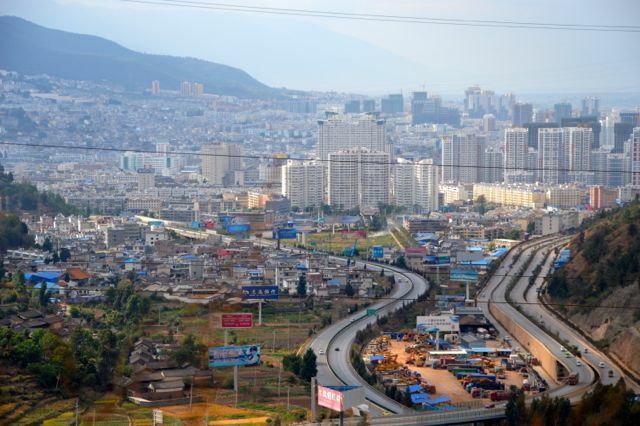 We are however in China, a country that is constructing roads at an alarming rate, and where change is a way of life. 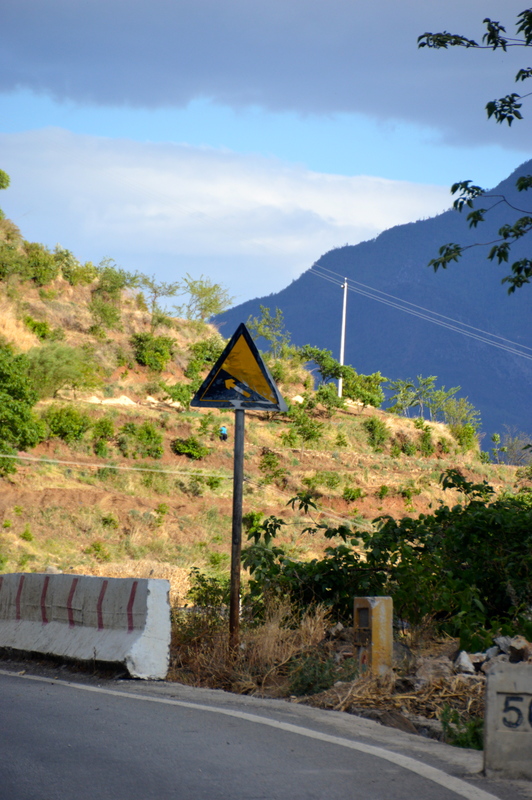 It was not surprising then, that our road simply ended with a boom gate and we were directed onto a secondary road. 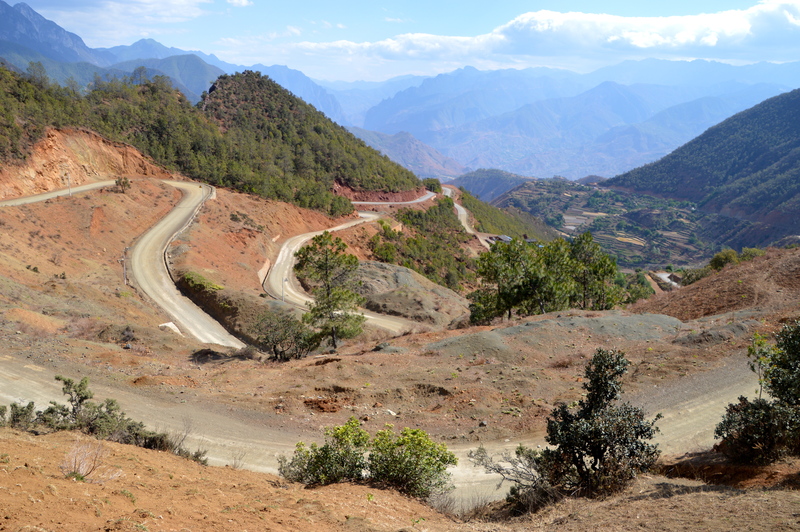 Later we would learn that this route added at least 100km to our journey, and was in use while the main road was being resurfaced. 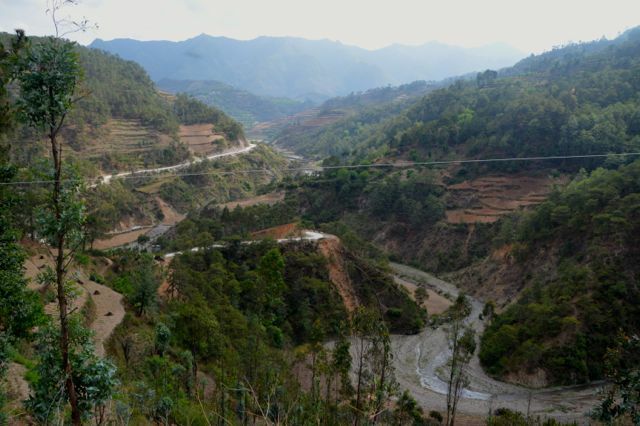 At first we weren’t even sure we were on the correct road, but after asking a man herding cows, we were assured that yes, this was the road to Lugu. 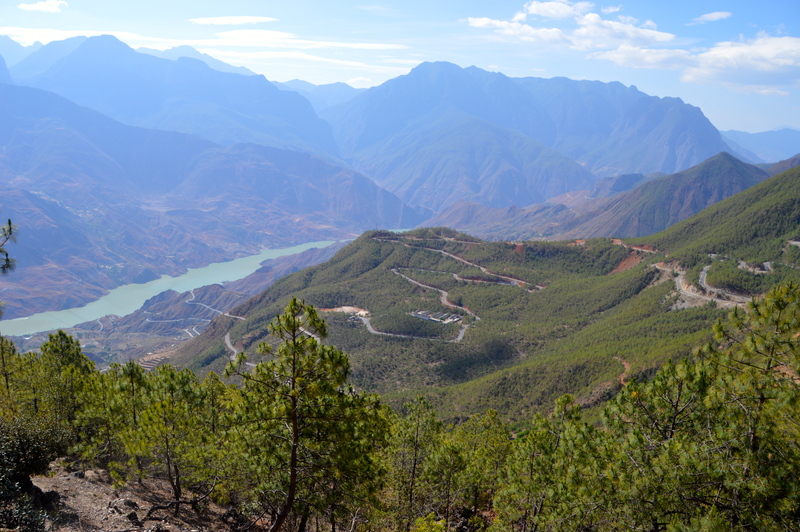 We climbed steadily through pine forest and then descended forever to a tributary of the Yangtze. 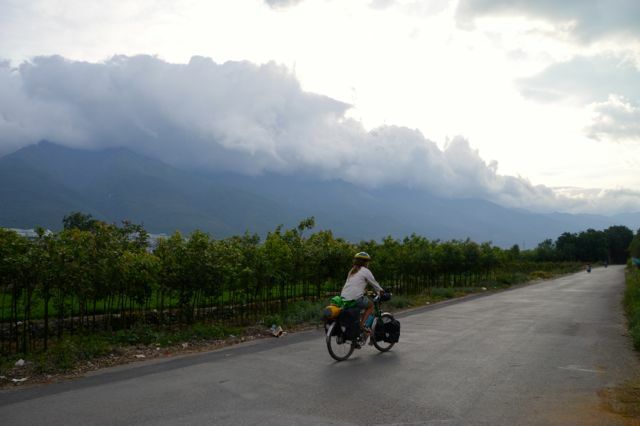 This was followed by an epic winding climb, past villages, rice paddies but alas, no shops. We really wanted a snack! 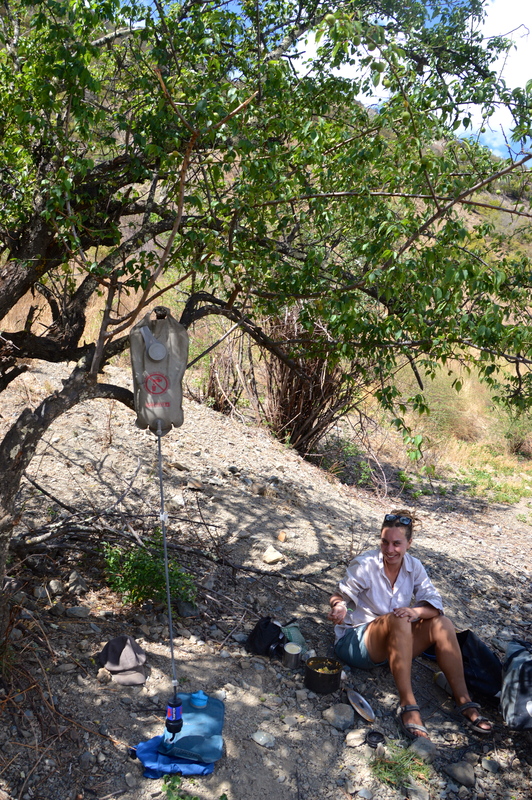 Finally around 5pm we found a small store selling biscuits and drinks, and gorged ourselves and collected some more water to filter. The lady who ran the shop was incredibly fascinated by my hair. 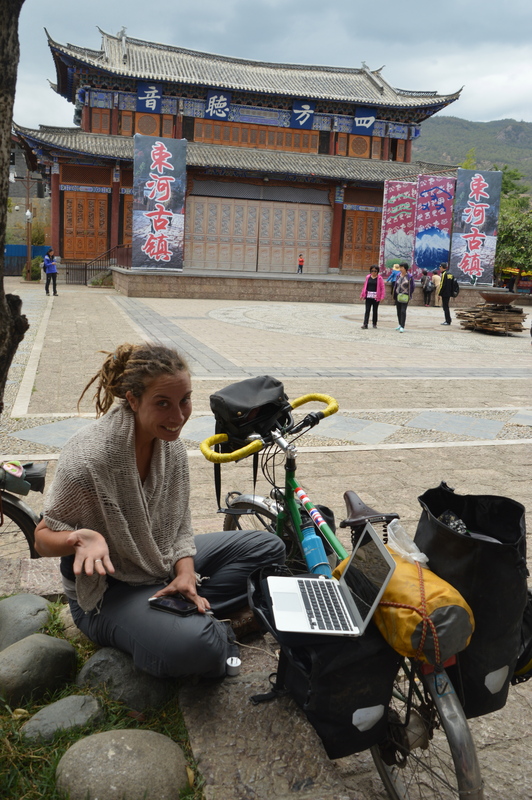 This would become a theme in China (people are often more interested in my hair than in Astrid or myself) and it was not long before we decided to give the dreads their own identity. They are now called ‘Martha’. Anyway, after she had admired and photographed Martha, we bid her farewell and continued to ascend. 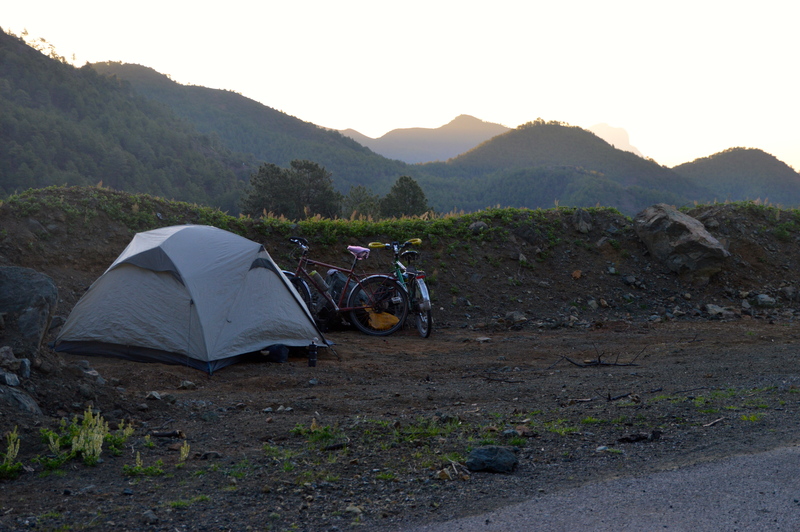 Soon the villages and traffic petered out, and just before dark we made our camp in amongst the pines. It felt so good to be camping again. 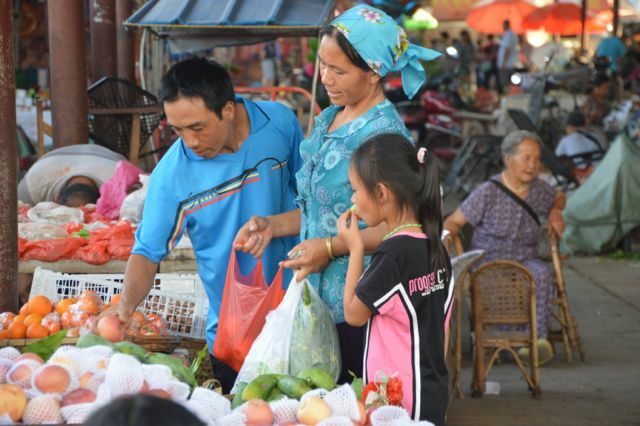 Best and cheapest place to shop, the local market. Continuous climbing through forest greeted us the following morning. And it was cold! 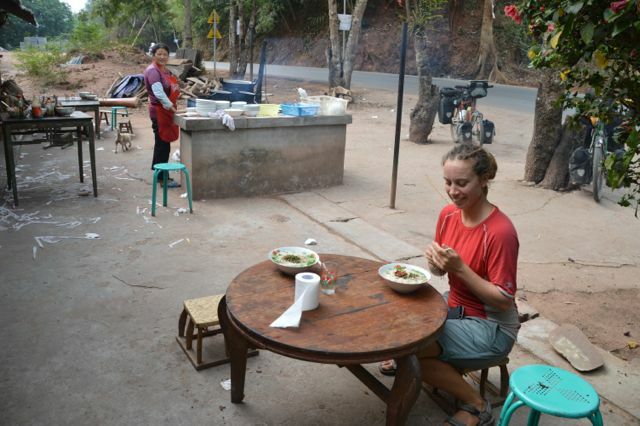 Soon we were afforded views of snow capped peaks, and lucky for us, also a small restaurant selling soup. The uphill was making us hungry! 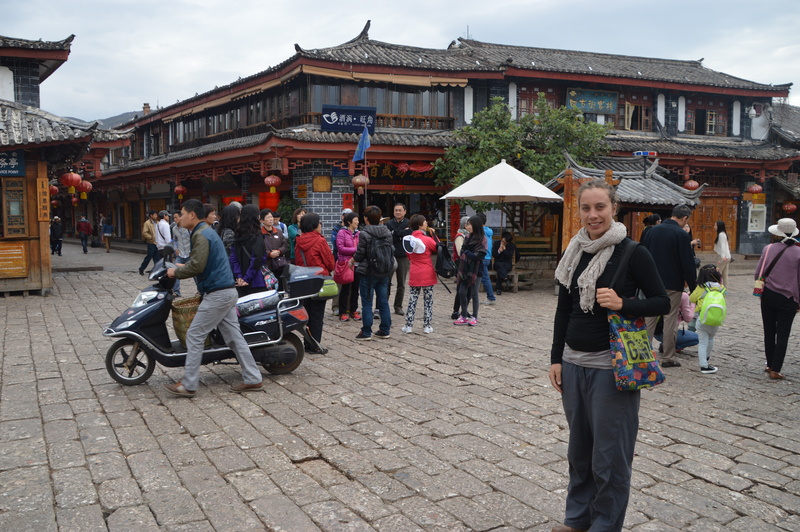 It was also where the Chinese tourist buses stopped, transporting the New China. Urban middle class Chinese, toting Cannon’s and wearing Northface, on a whirl wind tour of a chosen province. Something unimaginable a generation ago. Some spoke a few words of English and soon their curiosity overcame their shyness and we were asked what we were doing, and for the obligatory photo shoot. Everyone was so positive and friendly, we really can’t say enough about how wonderful the Chinese are. 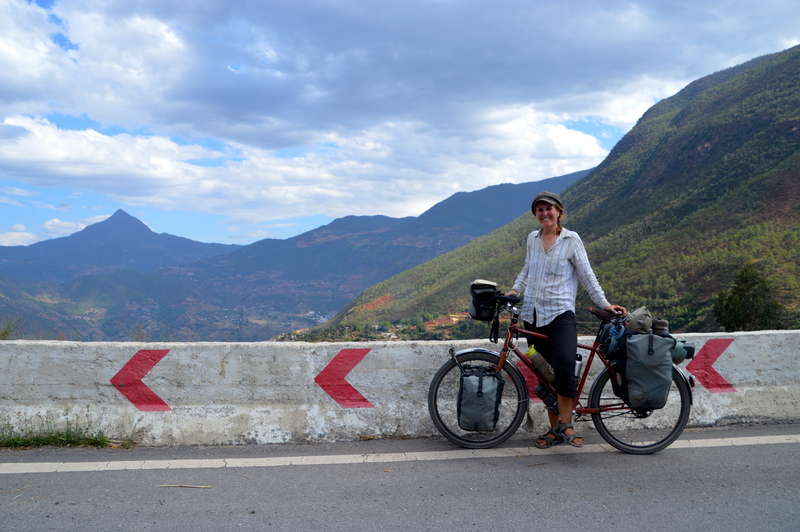 In the late morning we passed through a town, where we bought supplies and then, yes, continued climbing. It really was unrelenting, but so beautiful. 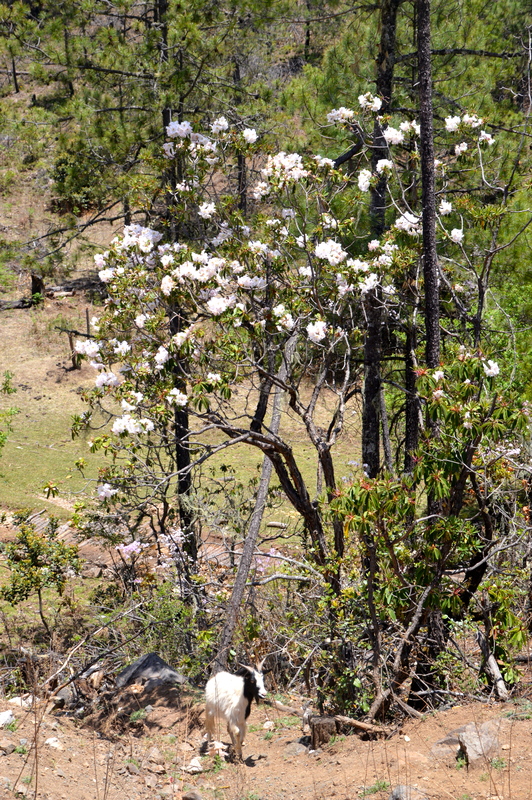 We began to see firs, some Spanish moss and even rhododendrons. 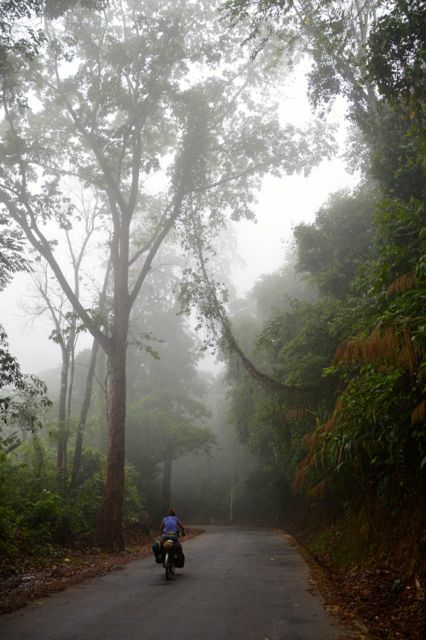 As the afternoon wore on, what was already a lightly trafficked road, became even quieter. 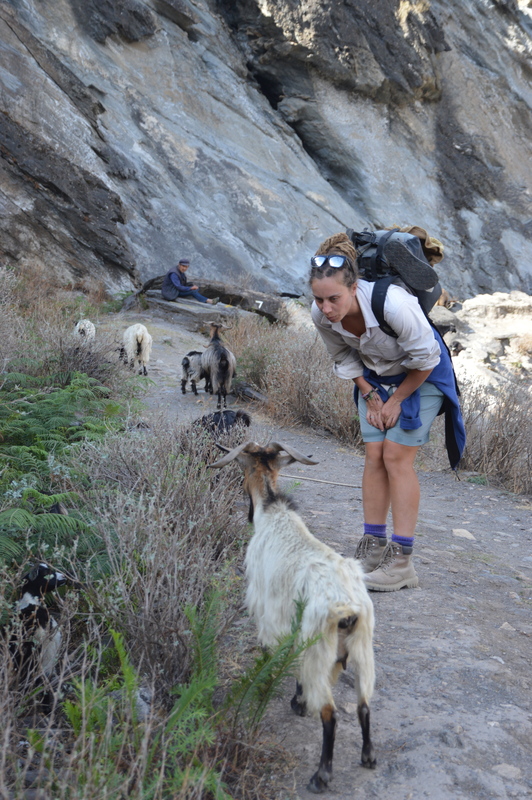 We would hear the tingle of cow bells, or spot a herder with his goats. 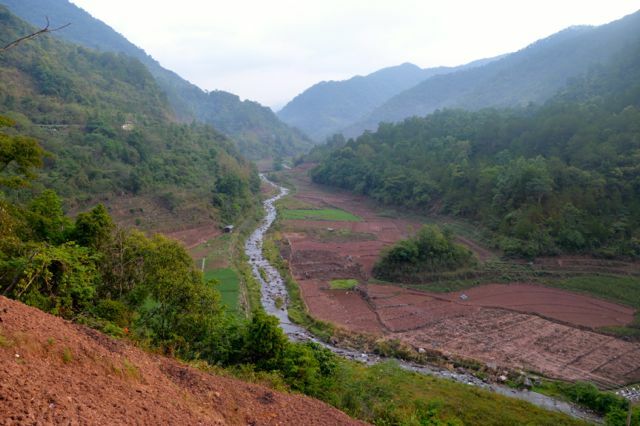 This was the other China, the one forgotten by the 21st Century. As the day wore on we began to feel like we couldn’t get any higher, as we appeared to be level with almost all the peaks around us. The view was incredible. Finally we reached a sign that told us we were indeed high, at 3660m! Both of us were really excited. Until we saw Yaks. 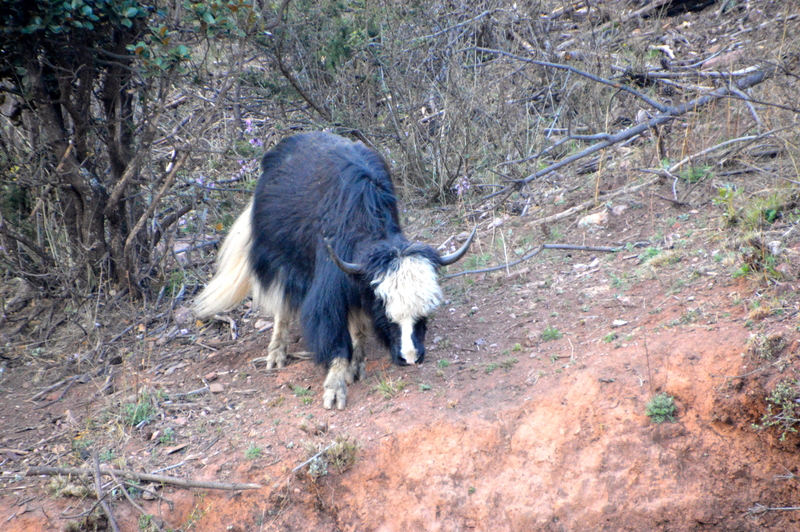 Then the Yaks were more exciting. Yaks. Wow. So adorable. I will let the picture’s tell of their cuteness. It feels like we are on top of the world. More yak’s. They are surprisingly agile and were high above the road. After losing our cool over the yaks it was time to find somewhere to camp. We were so high now, that it was freezing. All the spots we could see were way too exposed. Then Astrid had a brilliant idea. 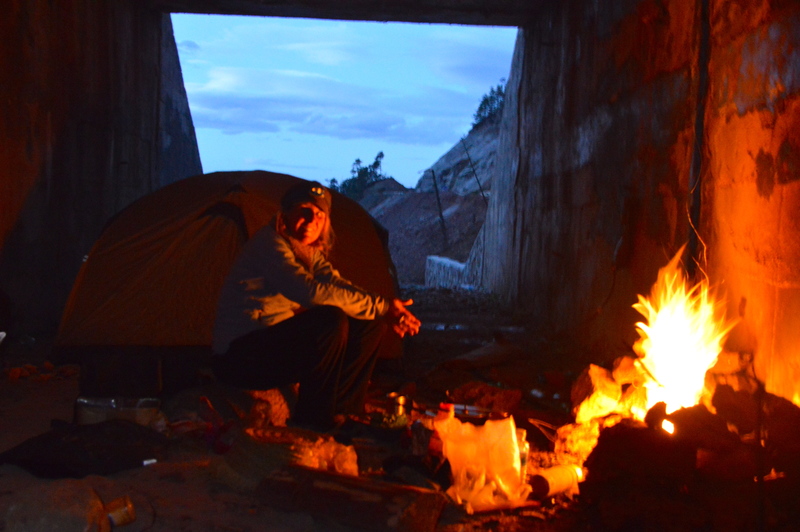 I am the one who has often been accused of being a cave troll, but it was Astrid who came up with the idea of camping in a tunnel under the road. Not only did it have a great view, offered protection, but it also had a place to build a small fire. Not since our days in the Australian outback have we enjoyed a cup of tea in front of an open fire. Perfect. End of the day ‘cup o’ soup’ from the front of our ‘troll cave’. 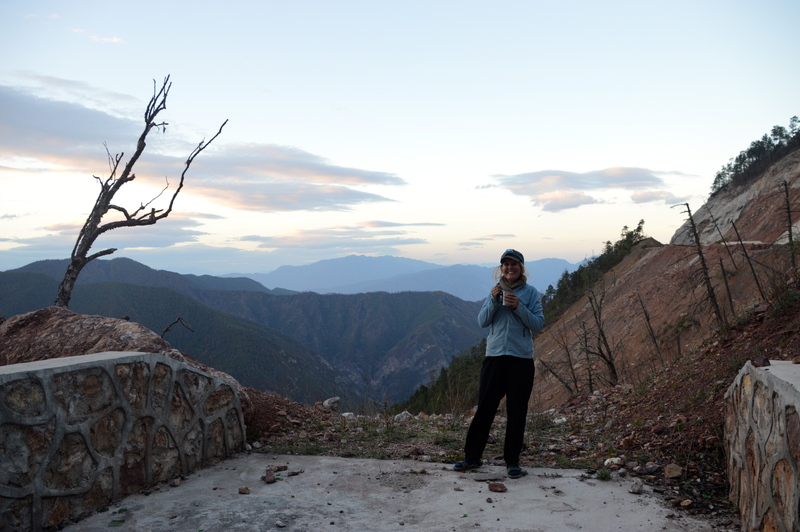 Watching the sun come over the mountains from our ‘troll cave’ we both felt that Lugu was within our grasp that day (at this stage we did not know how much longer the road we were on was). 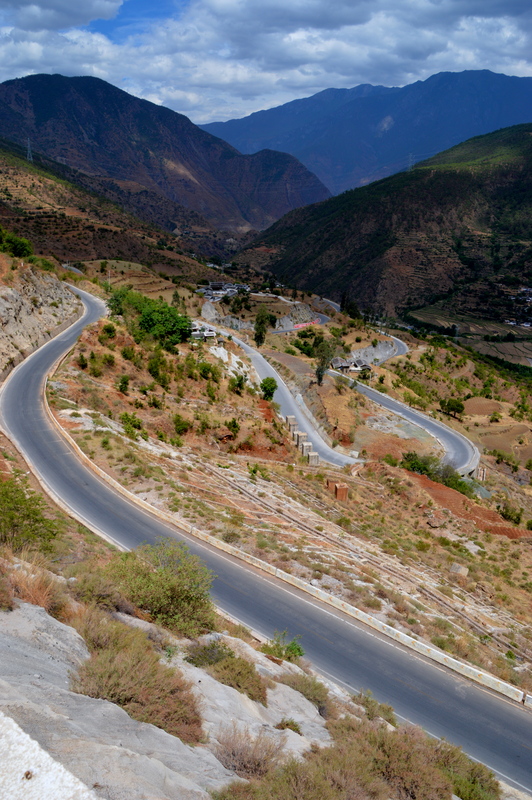 A few kilometres further on and a ripping descent began. After almost two full days of climbing it felt amazing (except for my brakes, which are on their last legs and complained bitterly). 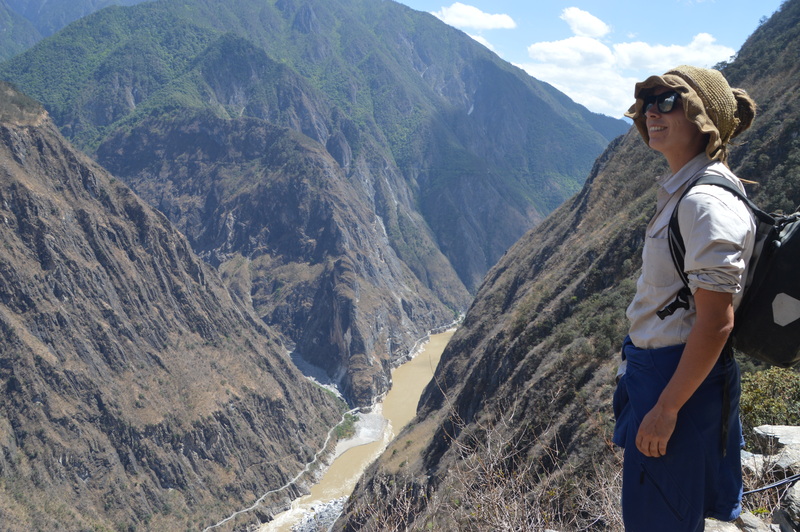 The views of the Yangtze were incredible and I ignored the fact that we were descending into a basin, surrounded by nothing but mountains. At the bottom, it was hot! We pealed off our layers of clothes and set about finding some food. After soup, ice cream and chocolate we felt like we could almost face the climb out. Is that downhill I spy? Yep! 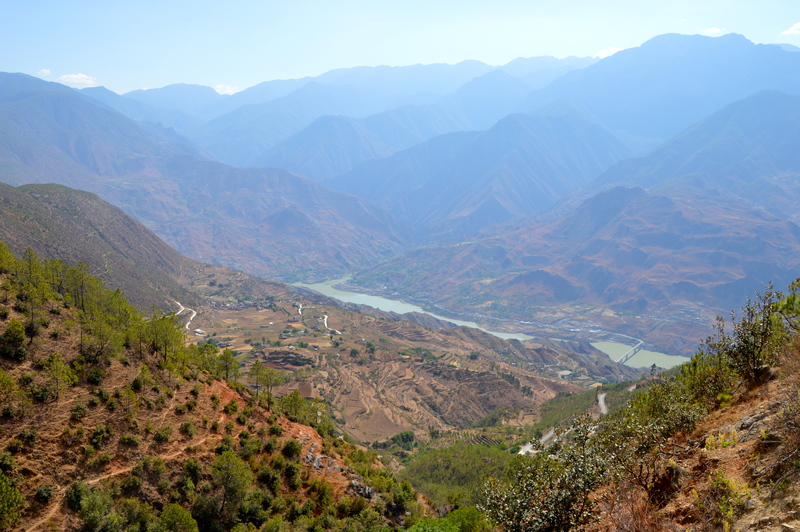 Down to the Yangtze. 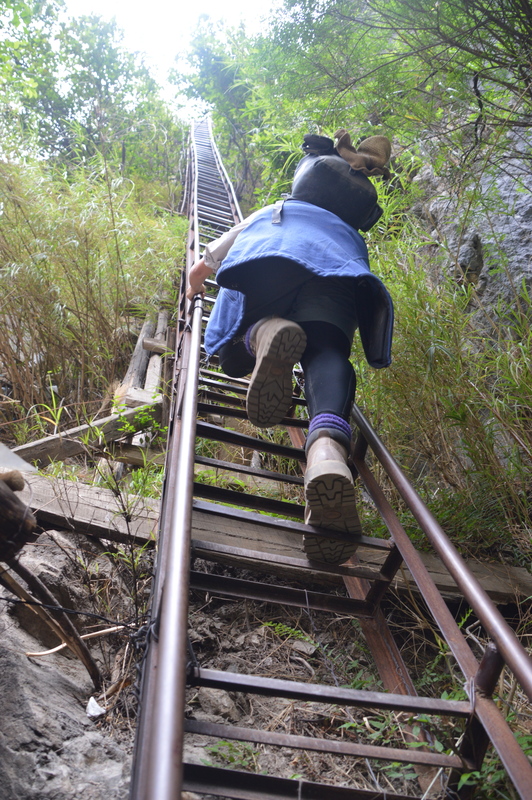 It looked very steep. 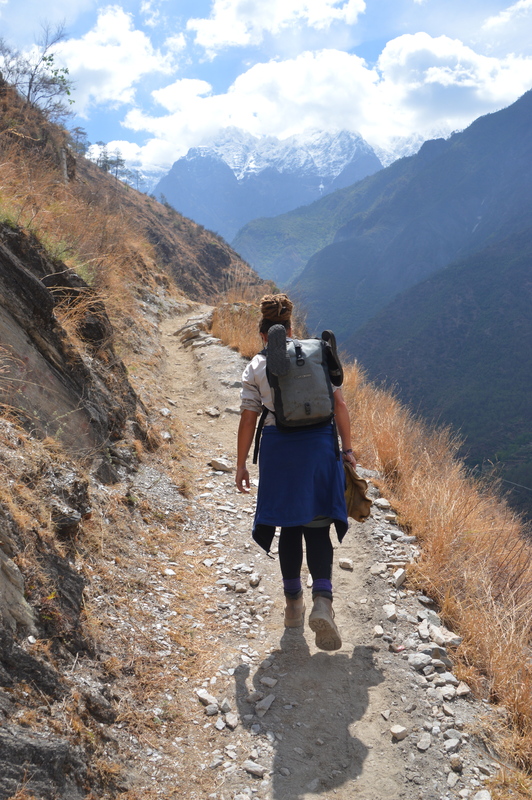 The road ascended as far as the eye could see. 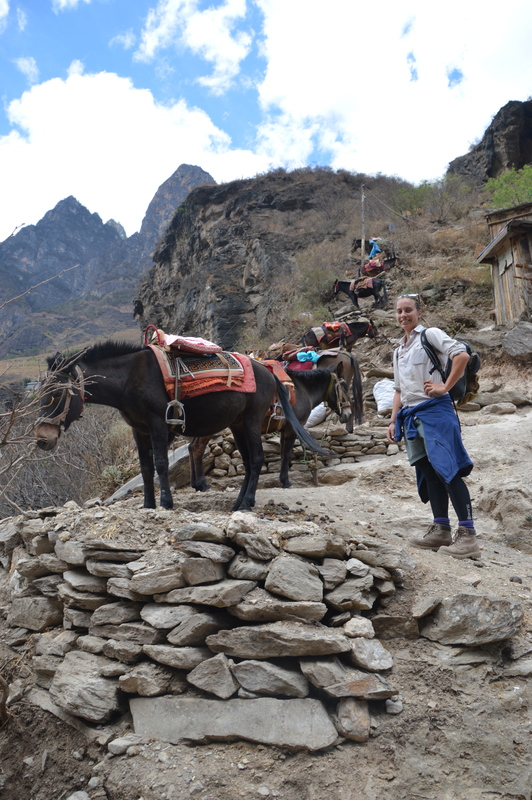 We climbed at first through dry and cultivated land, passed small villages, crops and herds of goats. 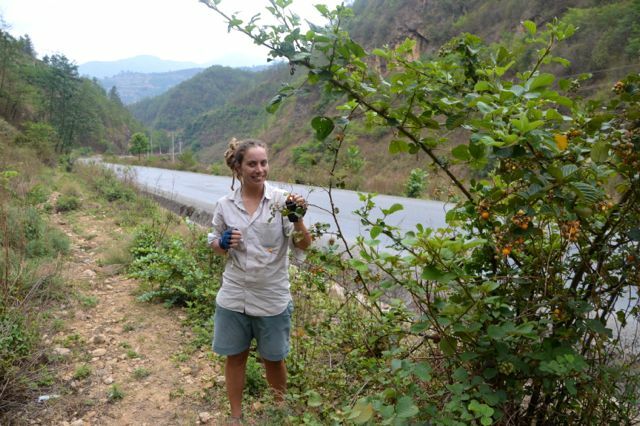 As the afternoon wore on, the road deteriorated, slowing our progress. Soon, the air became thin and cold again and we were climbing through the most beautiful forest of Spanish moss and firs. 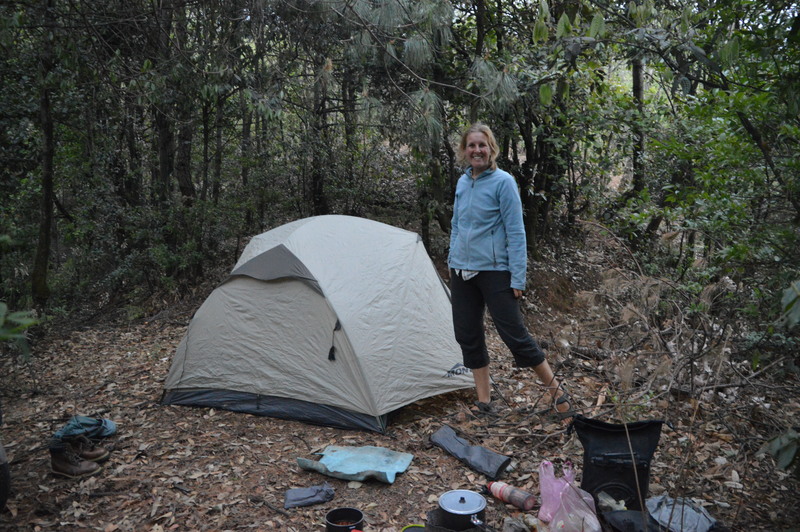 It was perfect camping terrain but we both felt we could still make Lugu that day. The light began fading (which meant it was close to 7pm) and our progress was down to 5km per hour due to the incline. Still, we were nearly at the top. 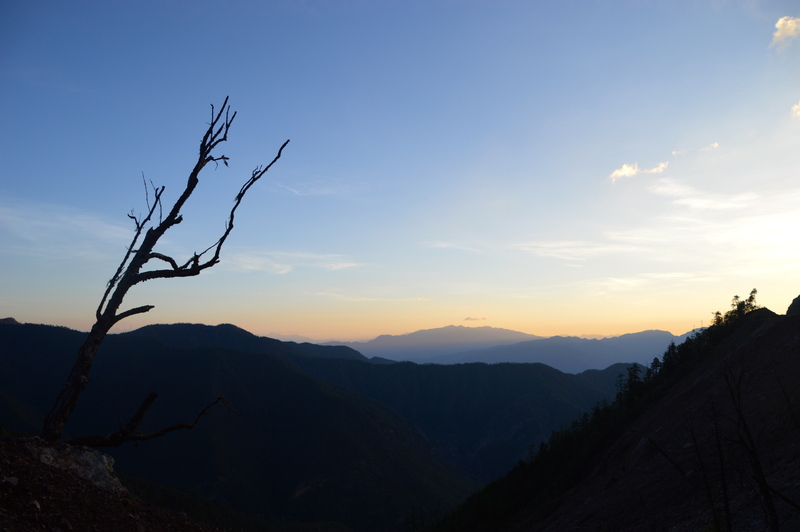 The summit was reached as the last rays of the sun were fading from the sky. It was freezing. 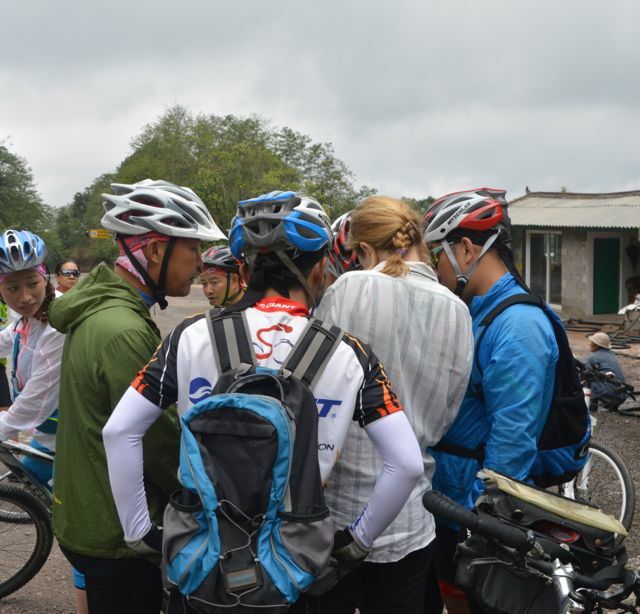 We piled on clothes and switched on our lights, anticipating around 25km of downhill to go. 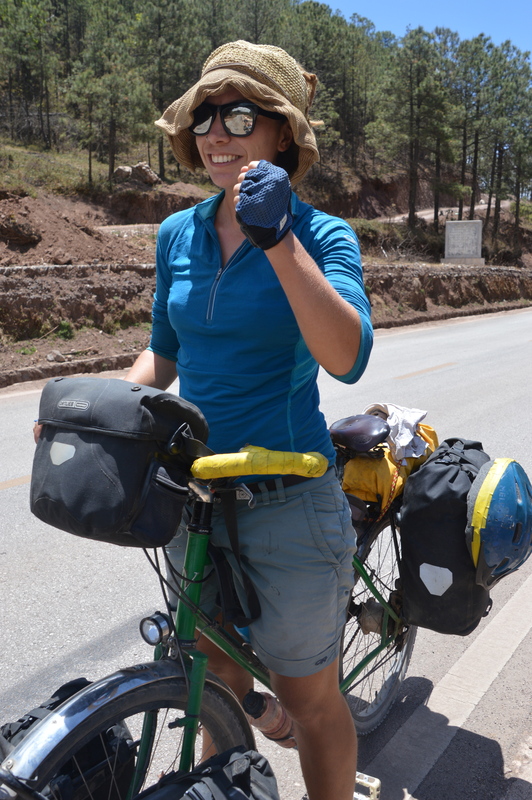 Unfortunately (or fortunately in this case) Astrid’s dynamo was broken, meaning that her lights were not amazing. Descending down a winding, steep mountain road in the pitch dark, you really want amazing lights for that. So after inching our way down painfully slowly for about 8km Astrid called it quits. It was simply too dangerous without two working dynamo’s, and too cold to continue on so slowly. Although we usually like to hide ourselves well, at this stage we were way too tired and cold to care, and instead pulled over at the first half sheltered place we found, right next to the road. The wind was incredibly cold and the tent was put up in record speed, more layers were added and we scrambled into our sleeping bags. Too exhausted (and cold) to cook, we ate a left over apple with peanut butter for dinner and then promptly fell asleep. Down on the valley floor. It’s time to face the climb out..
A break from the climbing to filter water and eat a second lunch. The decision not to push on was a smart one. 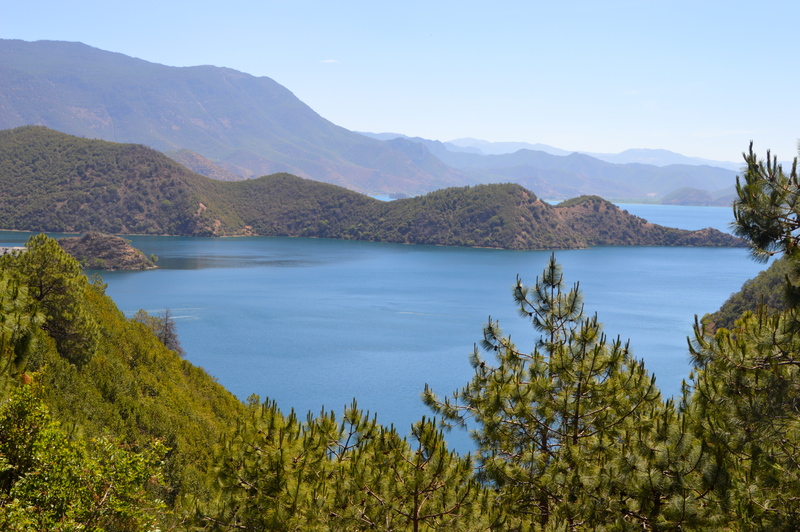 Although we thought Lugu was only another 17km down the road, we were mistaken. 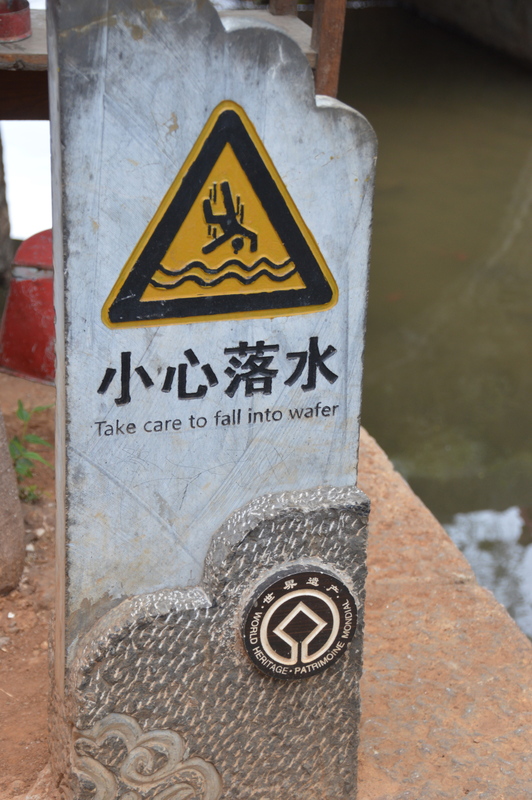 Signs on Chinese roads should never be trusted! 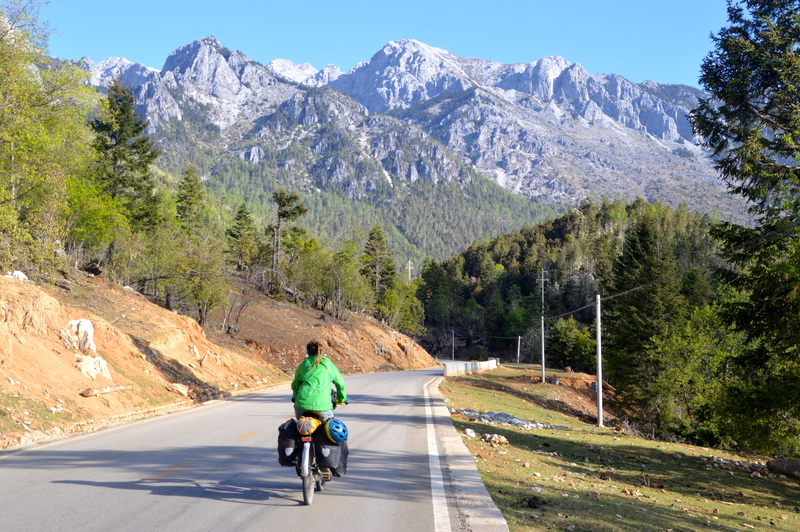 In the morning we set off on what we believed would be a short 17km descent. This was not to be. 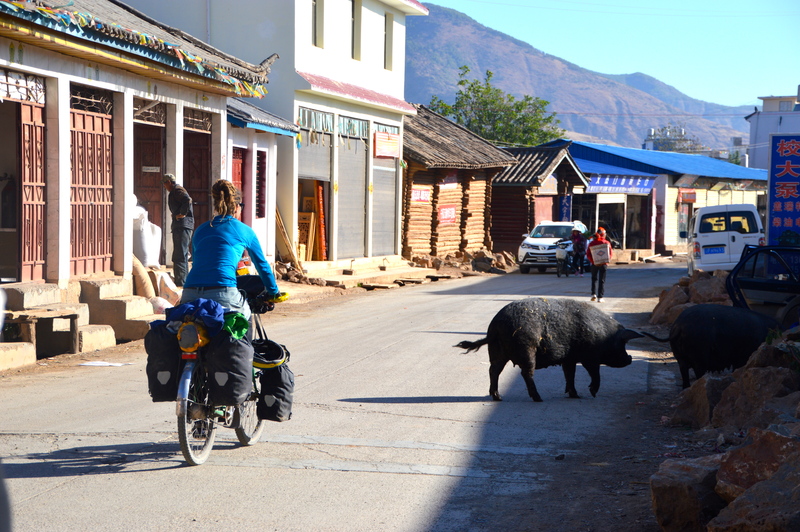 Instead we found ourselves in a muddy town, where pigs and rubbish covered the streets in almost equal measure. 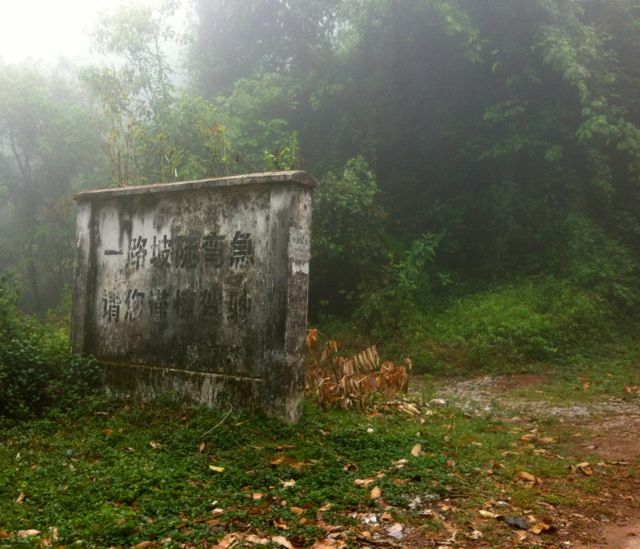 To this day it’s the only really dirty Chinese town we have come across. 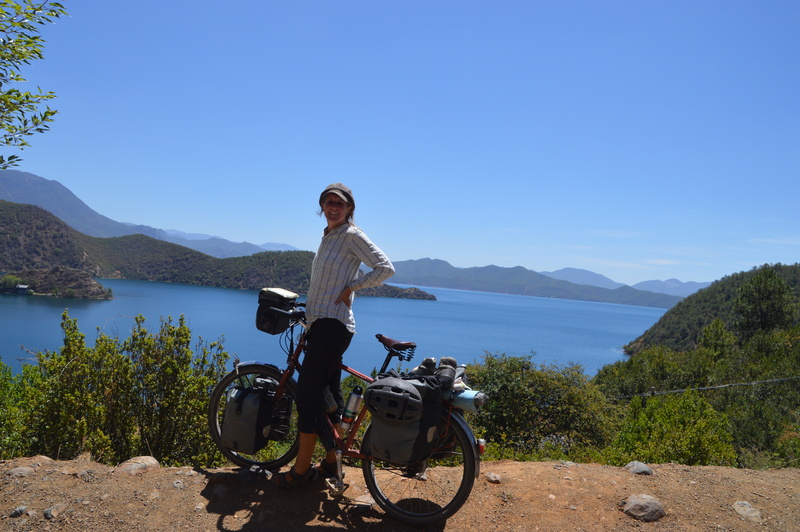 We cycled around, looking for the lake and feeling perplexed and relieved that we had not arrived here at 10pm the previous night. 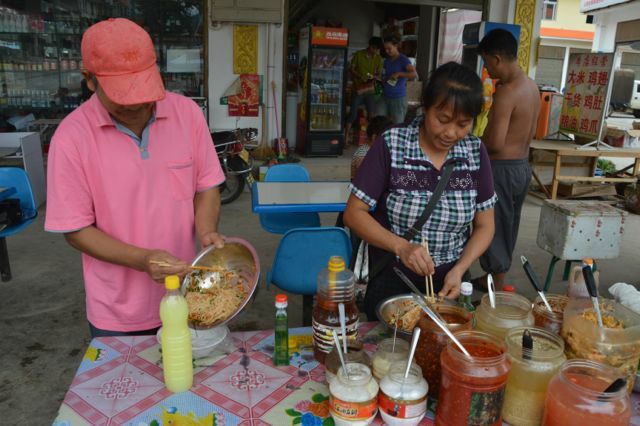 Eventually we decided to have some breakfast and ask some locals where we were. Up until then no one had been able to tell us, but after a bit of pointing at the i phone (which wasn’t working properly) and hand directions we figured out we were 10km from Lugu. To two exhausted cyclists, this seemed insurmountable for about 5 mins. 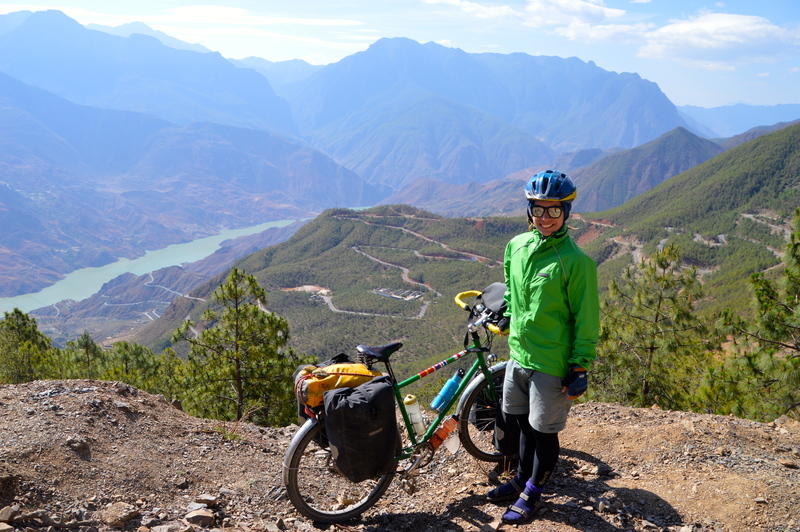 After some rage and quiet swearing, I gathered myself together and we both cycled the remaining kilometres to Lugu. 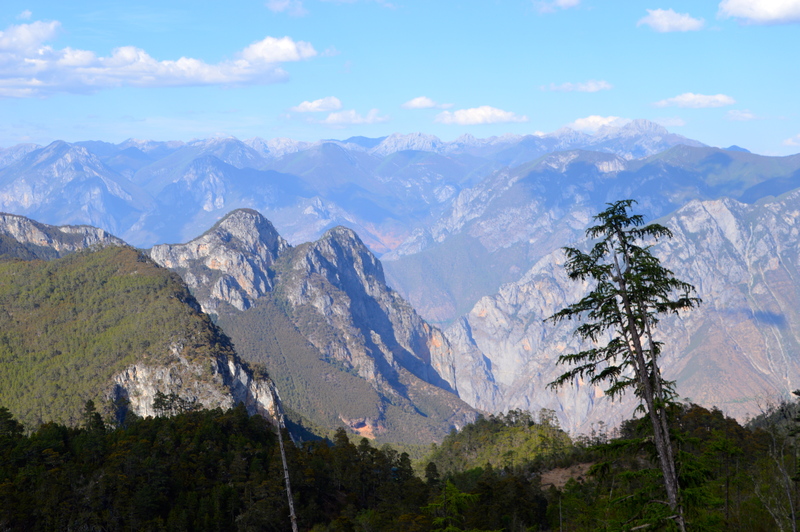 Luckily, this was primarily through a flat valley. 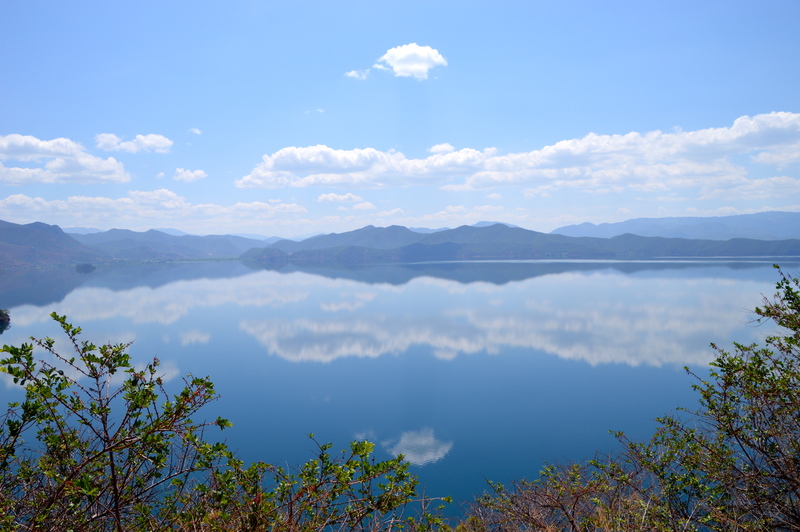 It was with relief and joy that we finally reached Lugu Lake. We took some time, just sitting in the sun and enjoying the view, which was spectacular. 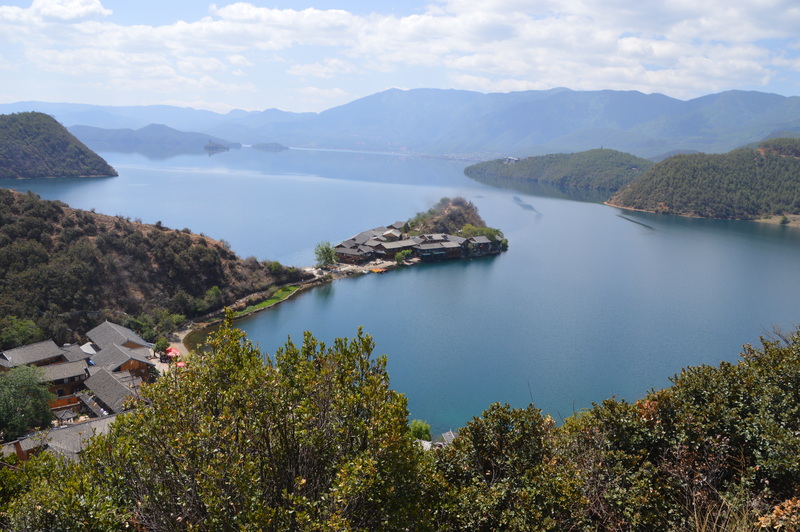 Our first glimpse of Lugu Lake. It was worth it. Yep, it really is beautiful! Lige. 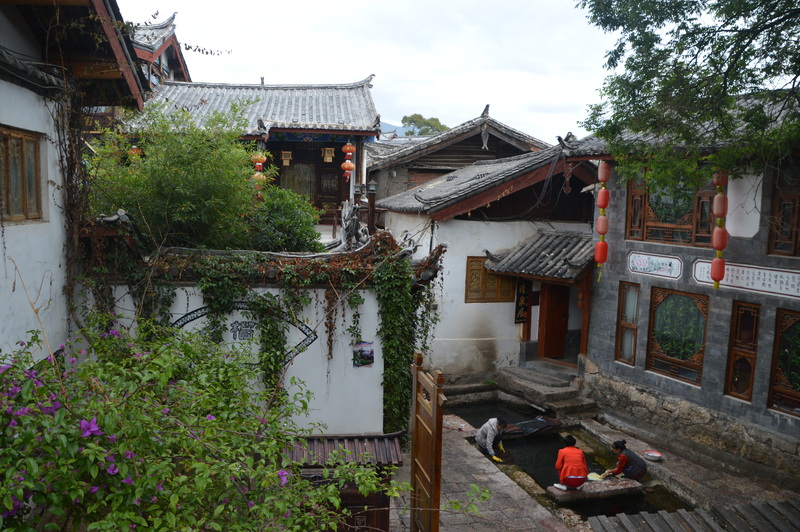 Pretty typical Chinese tourist town. 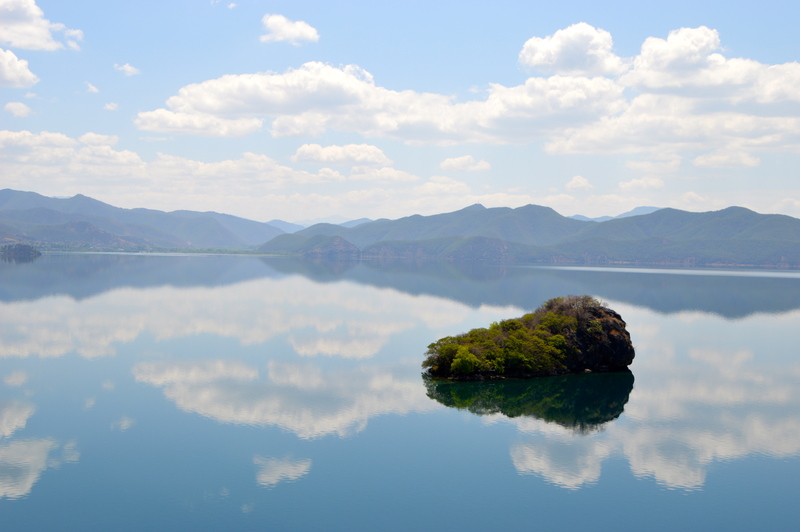 View of the island across the lake. You can get there via a bridge. 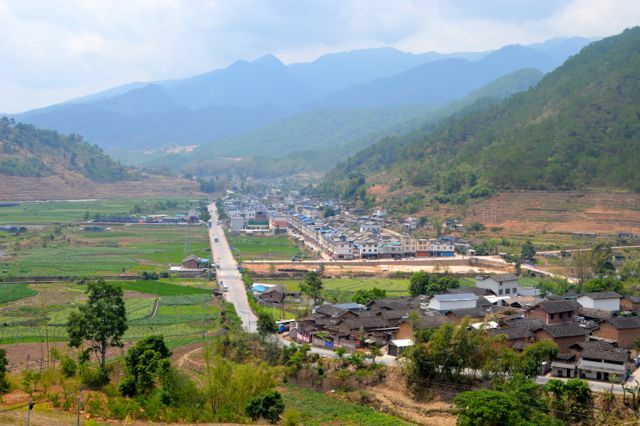 From the initial view of Lugu, in was a short descent to the tourist town of Lige. 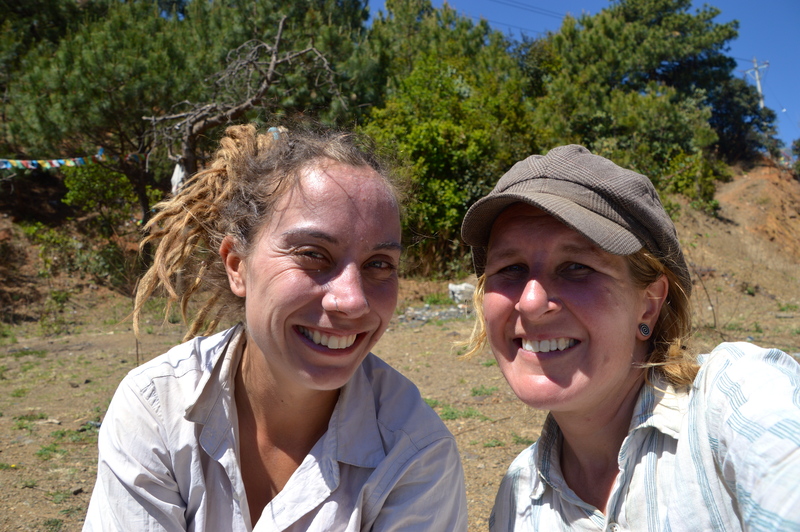 Here we secured some accommodation and set about dealing with the necessities of living on the road. 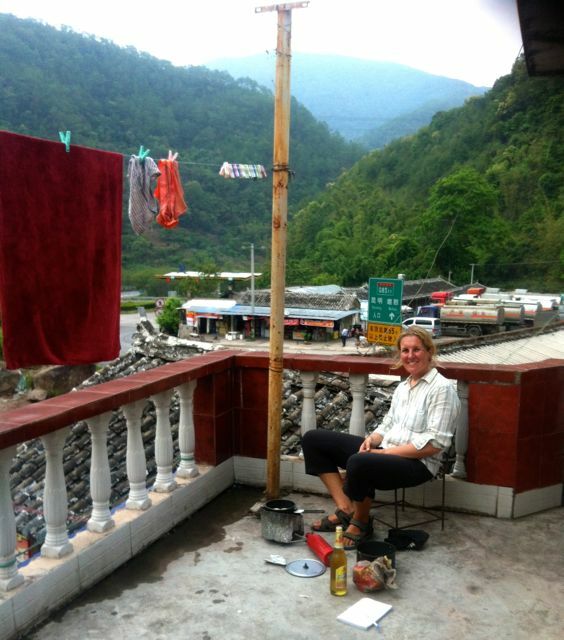 Which included an immense amount of washing, drying the tent, cleaning our cooking pots, contacting our families and showering. This was interspersed with cups of tea and snacks. Finally in the late afternoon we wandered around the town and sipped some well earned beers while watching the colours changed over the lake. Time to be a tourist in China. 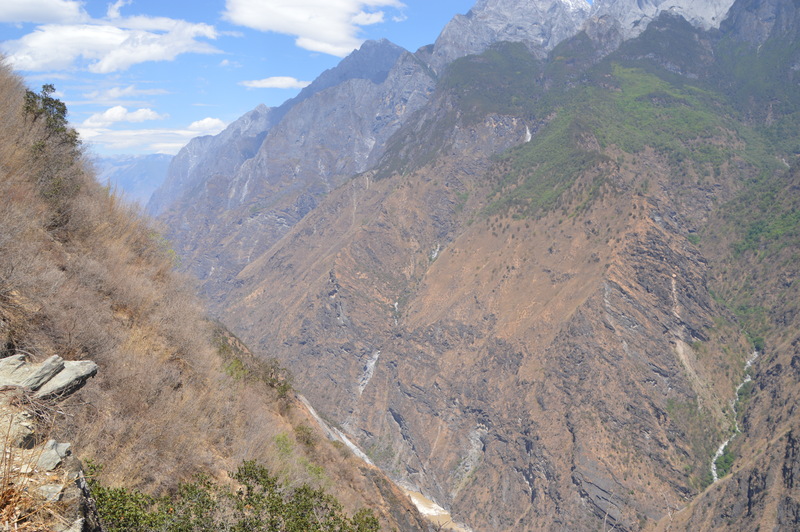 Dali, Lijiang, Shuhe and Tiger Leaping Gorge. 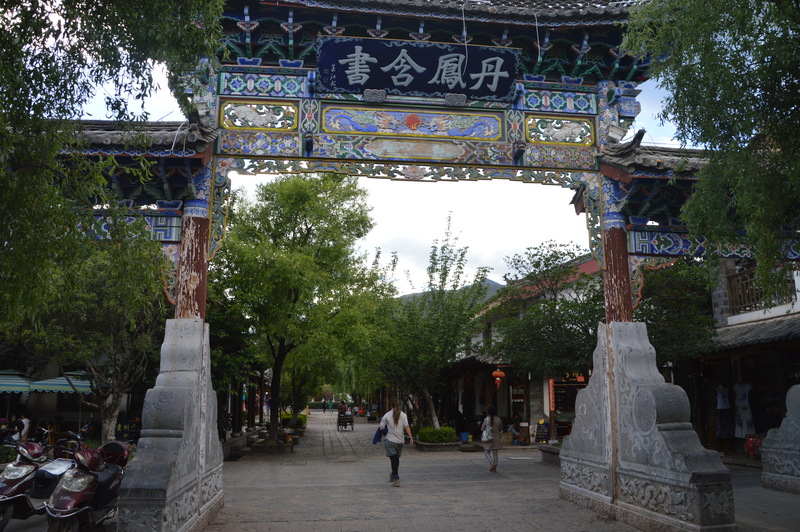 We explored the historical cities of Dali, Lijiang and Shuhe. 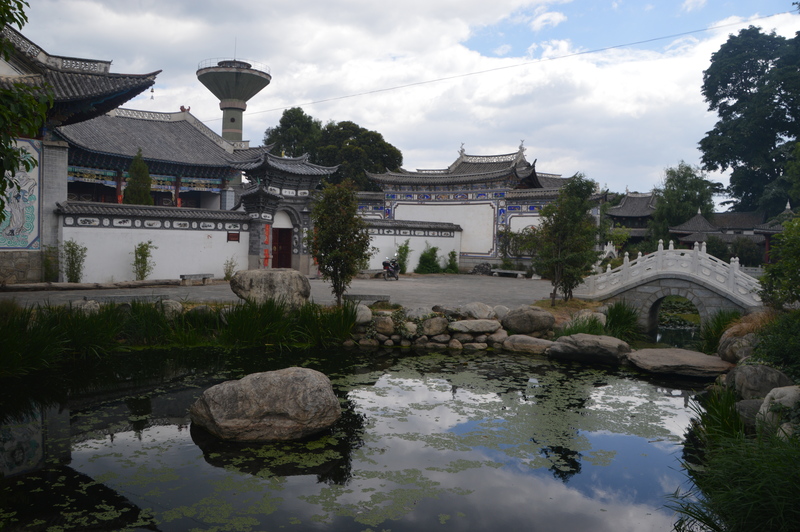 After cycling through the relaxed back waters of Yunnan, the tourist meccas of Dali, Lijiang and Shuhe were like stepping into a shopping mall on Boxing Day in Melbourne. 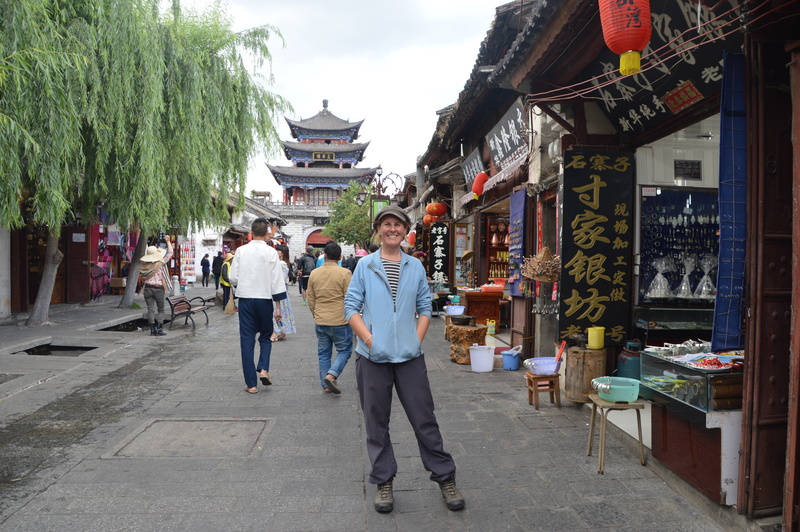 It was great to jump in with the crowds and explore the beauty of these (renovated) ancient cities, and then hide away with a cup of tea (or beer) in our guesthouse. 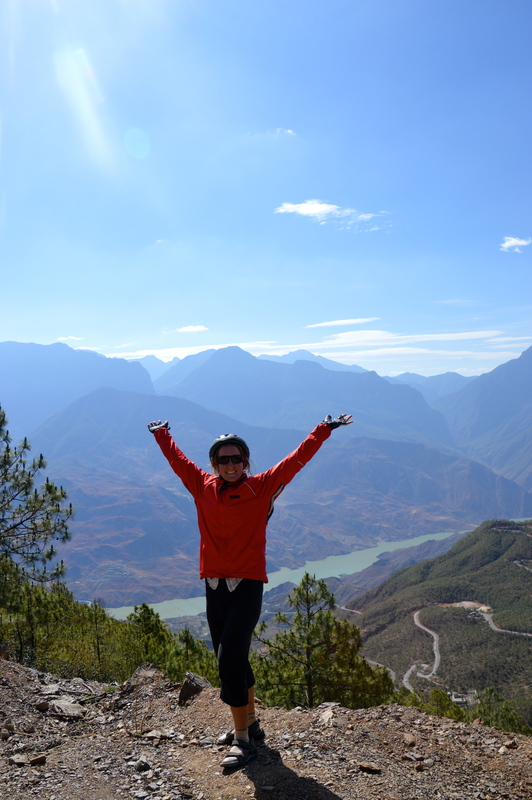 We were to learn that Chinese tourisms is definitely in a league of its own with large tour groups, astronomical price hikes and loads of bling. 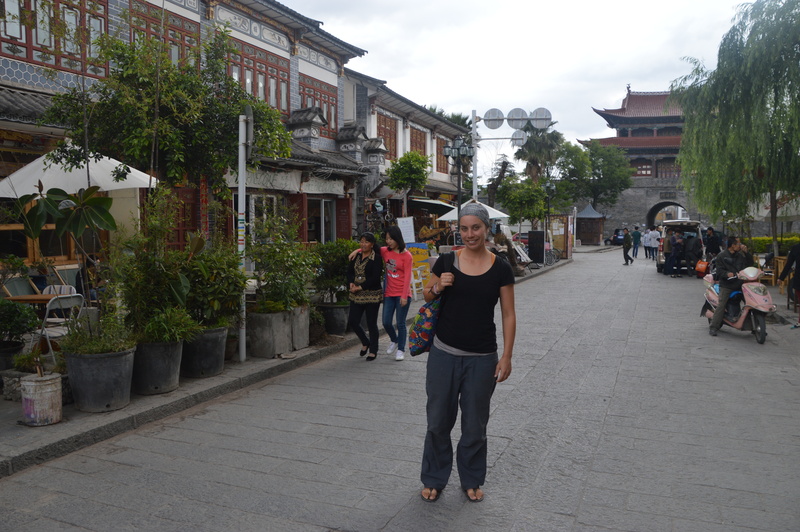 Having a leisurely stroll through the streets of Dali. Relaxing morning with tea, porridge and a book. 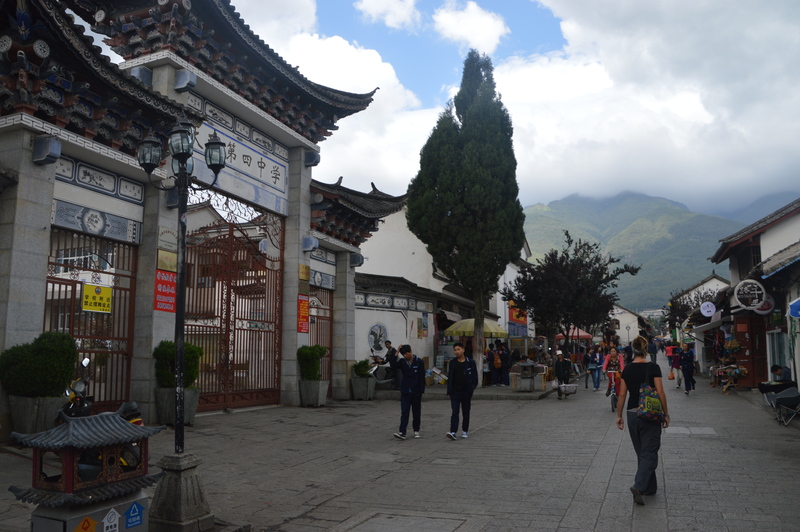 Main tourist street of Dali. Good coffee is a must for Jude, especially on rest days. 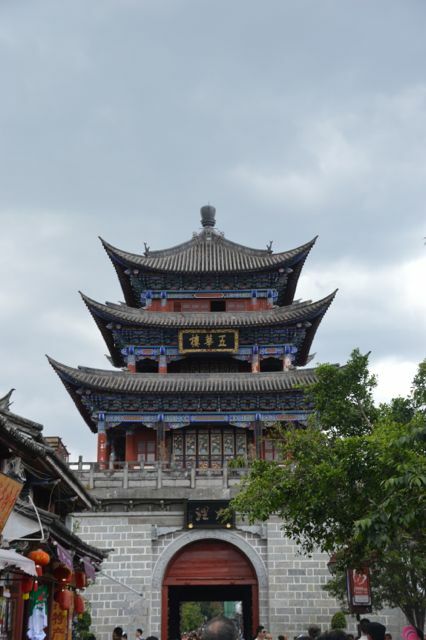 Luckily our rest day in Dali meant: no alarm waking us up, a relaxed morning with tea in one hand and book in the other, a leisurely stroll around town looking at the colourful old buildings, good coffee, tasty treats and a reprieve for my bum. We enjoyed ourselves so much that we didn’t want to leave the next day and a smattering of rain provided a good excuse for a sleep in before hitting the road. 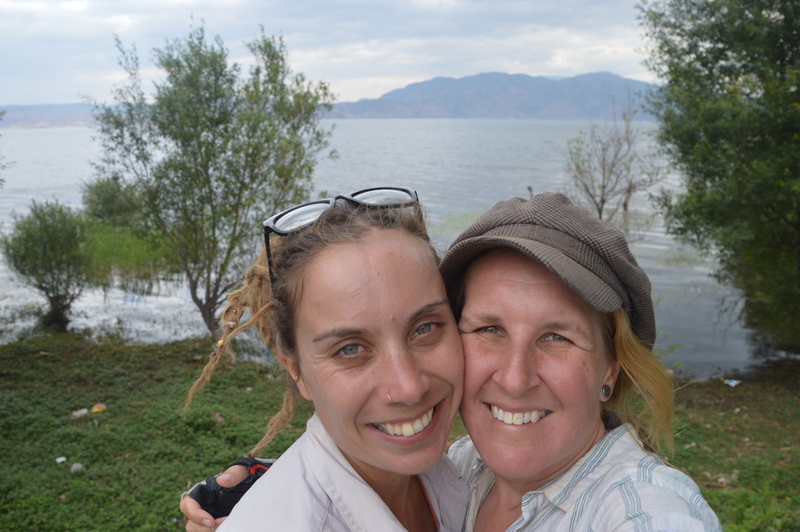 As we cycled out of town the clouds hung heavy over the mountains to our left, while the waters of Lake Erhai sparkled on our right. 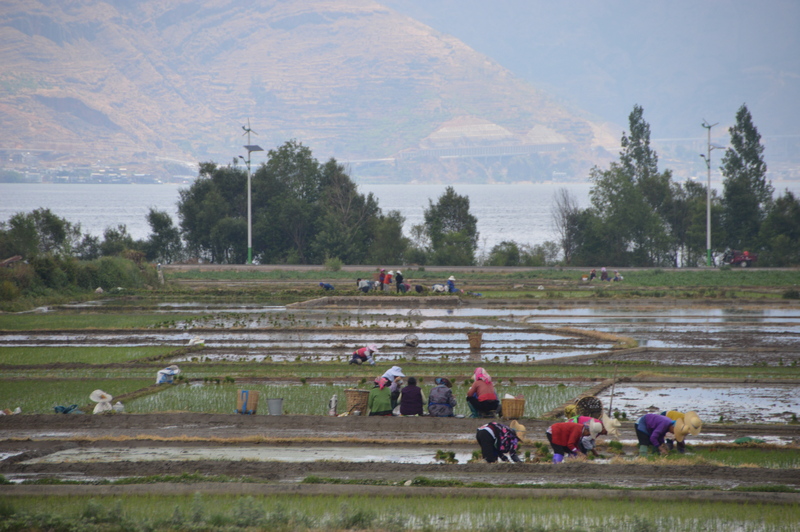 Despite cycling along a major road, we enjoyed looking at the fields filled with farmers tilling the land and large groups of women gossiping and planting rice. 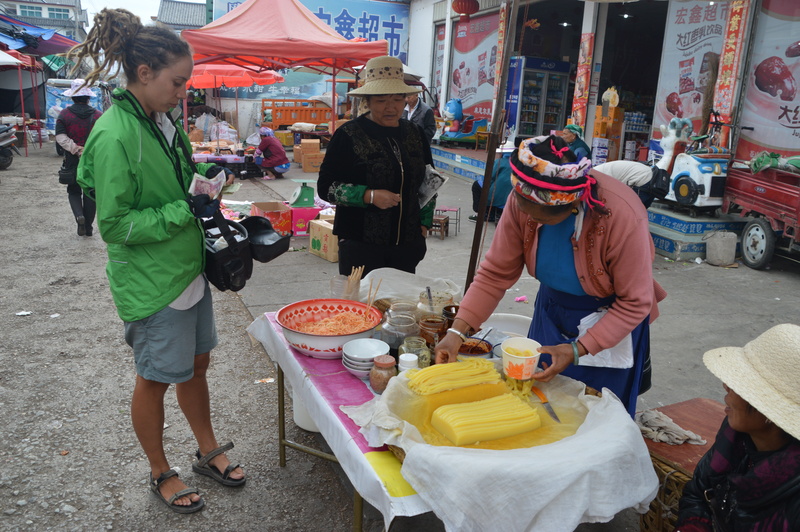 Passing through numerous Bai villages we admired the women in their traditional dress and enjoyed spicy hand made noodles and baked bread. 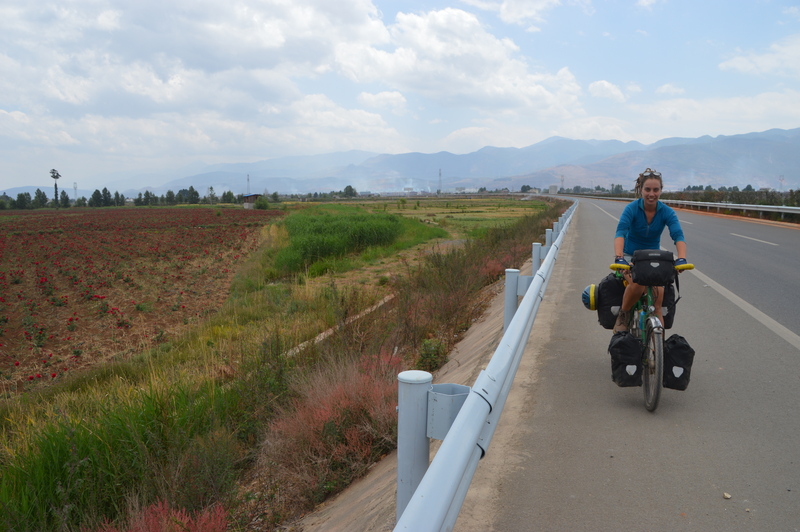 Near the northern tip of Erhai Lake we were passed by a group of cyclists who invited us to join them for lunch where we shared a veritable feast of food we would never have known how to order in our non-existent Chinese. Our funky hotel in Dali. 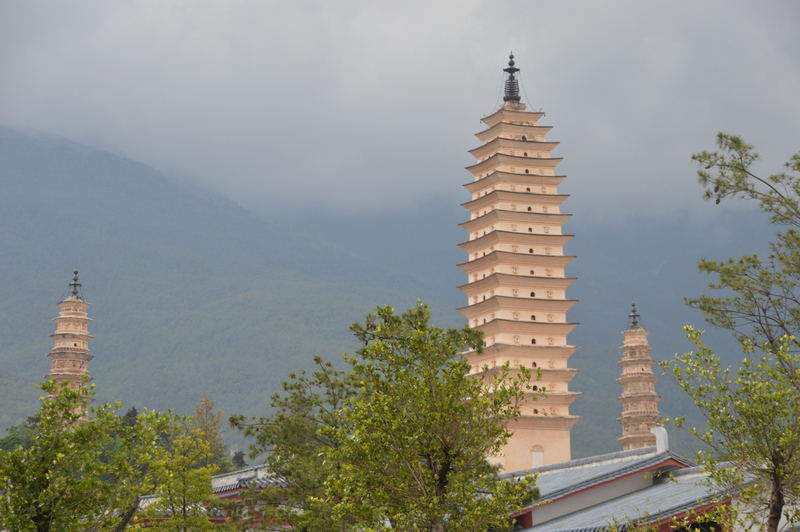 The three pagodas – Dali. 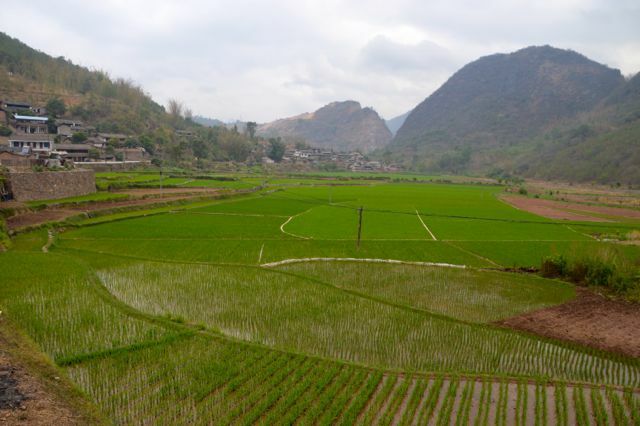 Women gossip and plant rice. 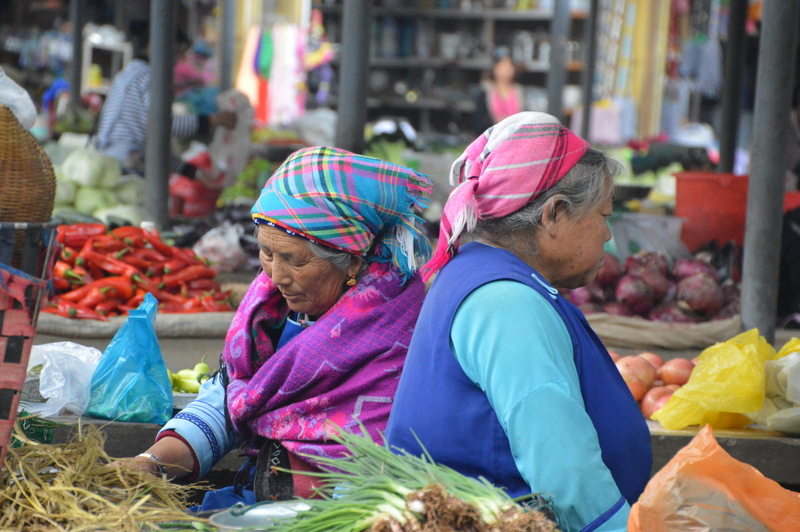 Bai women at the market. 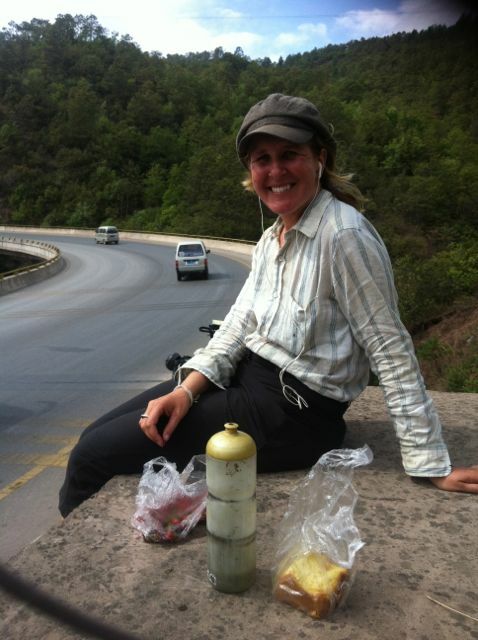 I’m still getting used to the decisions and concessions we have to make now that we are cycling through China. With limited time (due to visas) and large distances, our ability to be spontaneous has been dramatically curbed. 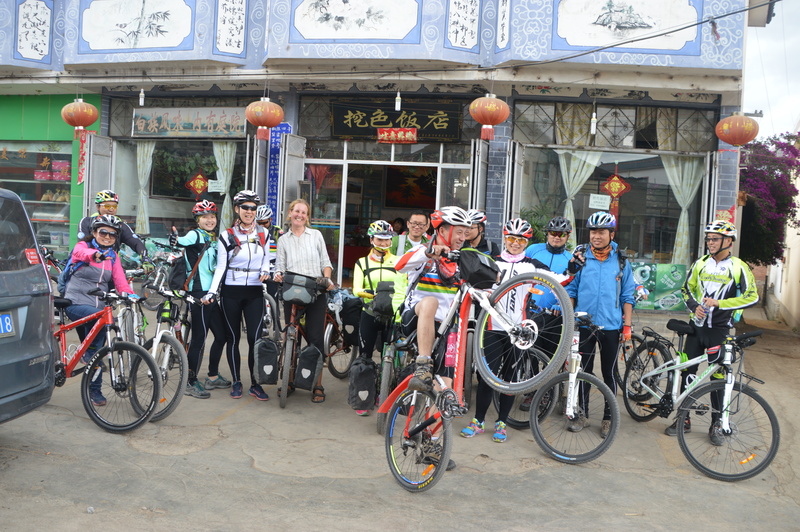 Our new cycling friends had inviteded us to join them for drinks at their next stop, but after cycling 15km in the opposite direction from the one we were meant to be travelling, we had to stop and have a serious heart to heart about how we were going to tackle cycling in China. 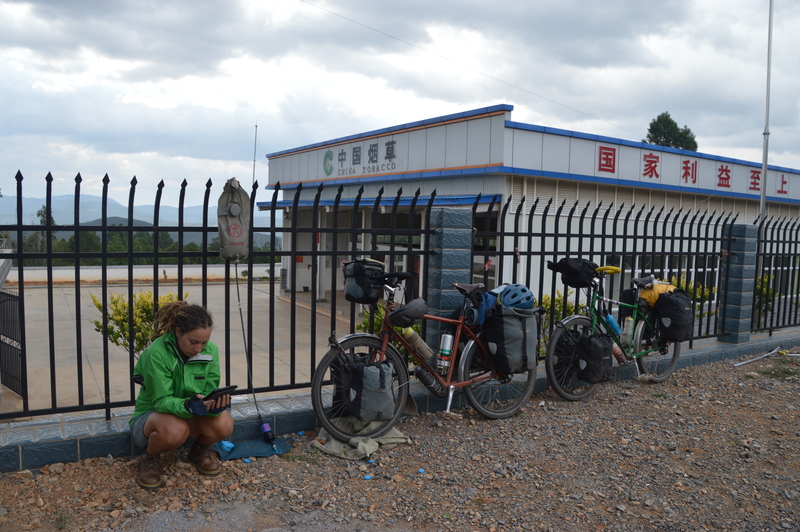 We decided that changes to our route can be made, but it needs to be in the direction we are going so that we can make it across China in time. 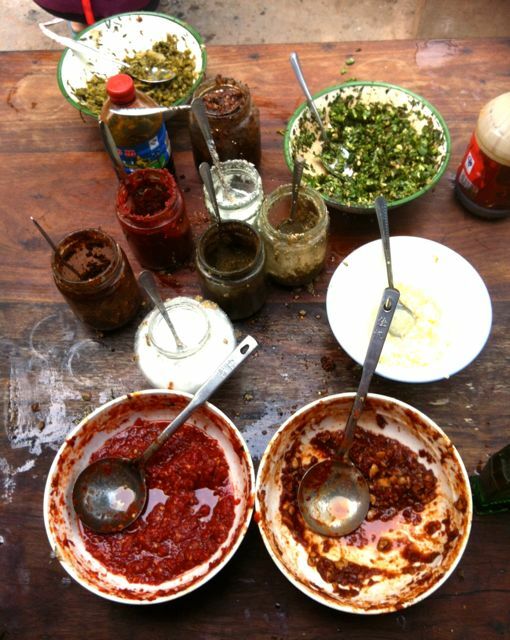 An amazing feast to be shared. Group photo shoot with our new cycling friends. Threatening clouds followed us that day. 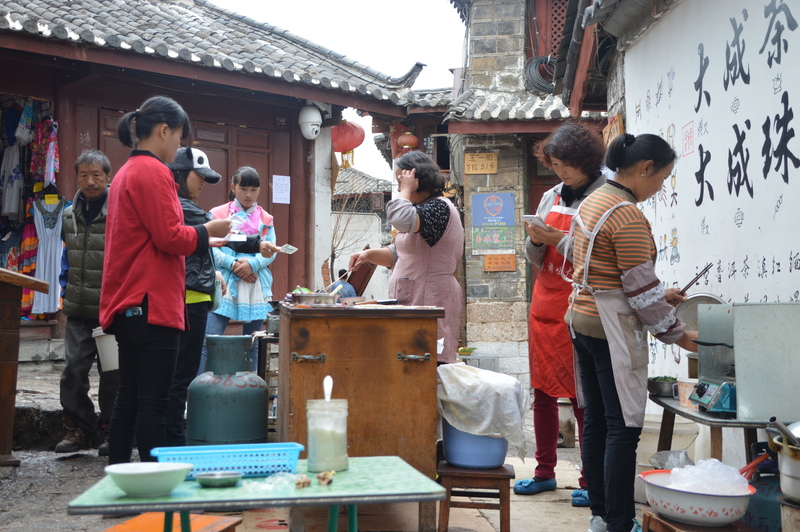 Feeling back at home – our first camp in China. 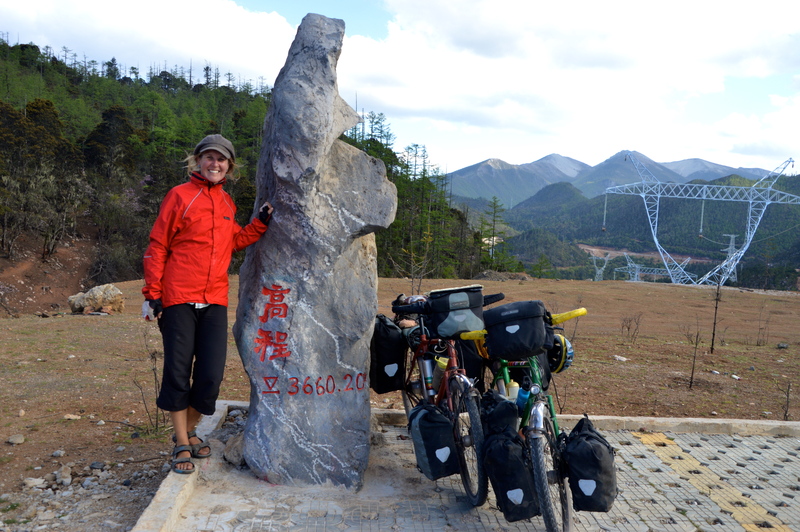 Back on track along the S221 we cycled for the remaining daylight hours, squeezing in a climb and just before dusk we made our first camp in China. Hidden amongst pine trees we snuggled in our tent and enjoyed the beauty of being back in our mobile home. 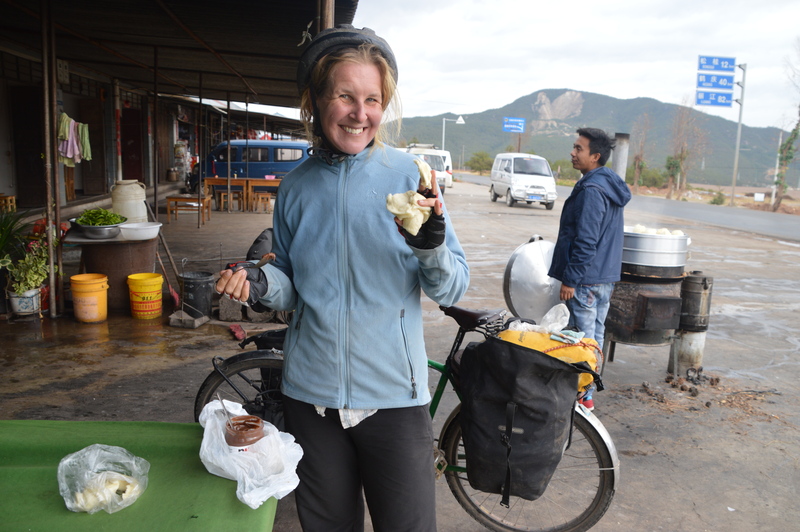 A handful of towns were dispersed along the road to Lijiang where we were able to collect some water and fill our bellies with steamed buns and plates of rice and vegetables. 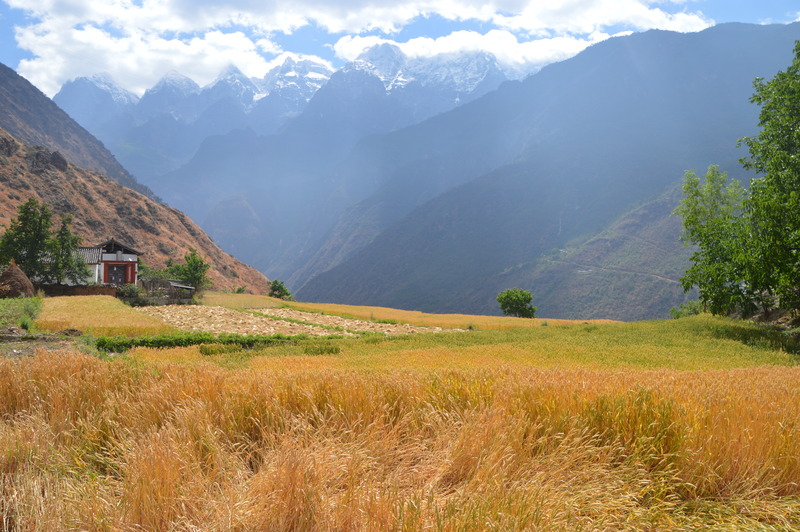 The valleys we cycled through were abundant with wheat heads swaying in the wind, the smell of roses mixing with smoke as fields were burnt after the cops were harvested. 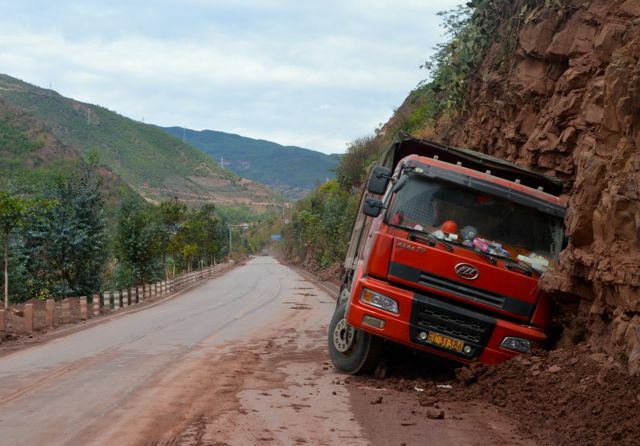 Roadworks are a constant in China and after sharing 30kms of potholed dirt road with impatient drivers we were excited to find ourselves alone on a new road which became a expresswayway. Despite big signs saying no bicycles, we thought ‘stuff it’ and cycled passed the toll gates to enjoy 40kms of smooth cycling in to town. Jude reads the classics while waiting for our water to filter. Steam bun heaven, especially when we added Nutella. 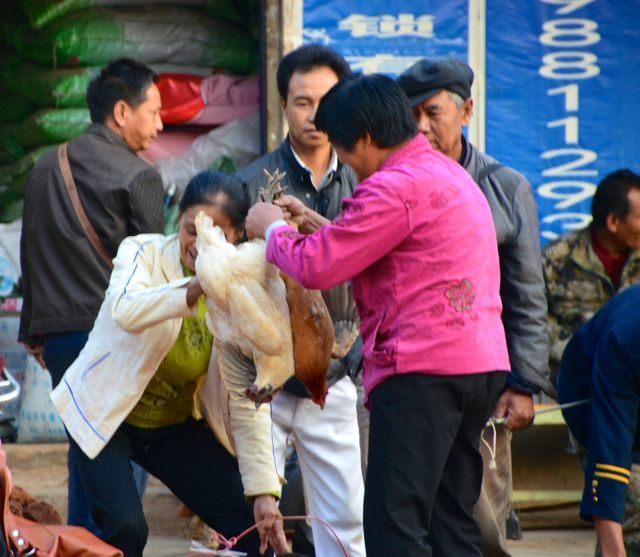 Typical Asia, women working while the men look on. Jude enjoying the smooth surface of the motorway and the smell of roses. 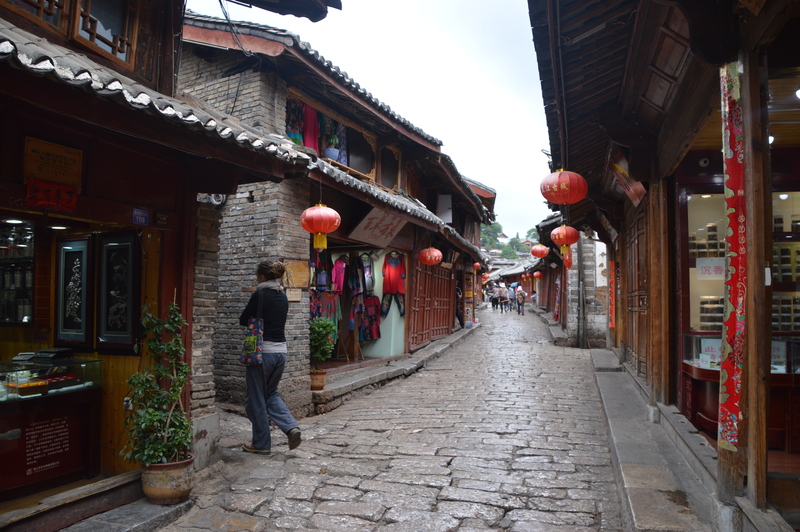 Old Lijiang town is what my tourist nightmares are made of. Flashy rebuilds, hundreds of shops selling the same three items, touts trying to pull you into restaurants, food and accommodation triple the normal price, and thousands of people packed into narrow streets and alleys while we try to push our laden bikes to find a place to lay our heads. Once inside our little courtyard we could relax and breathe again. 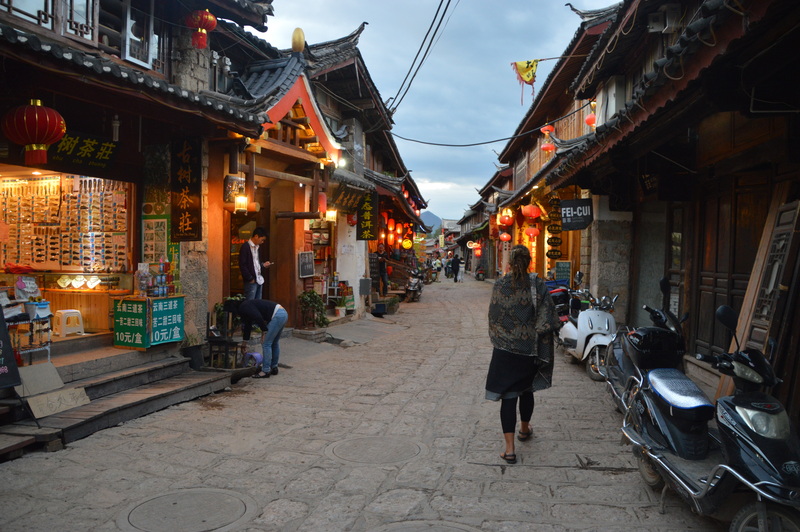 Around dinner time we did venture out, but if I had found our earlier foray excessive, Lijiang at night is like a show pony on speed. It was too much for a couple of road weary cyclists so we ate, we bought chocolate and we hibernated until morning when we could explore the town as it slowly woke up. 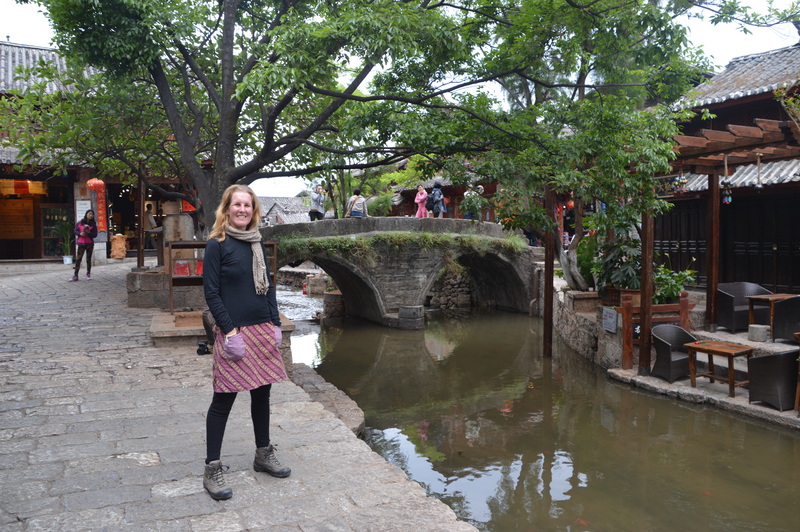 In the cool morning air we ate street snacks, laughed at the comically translated signage and became lost in the little alleyways that ran amongst the waterways that meander through the town. The streets run alongside the waterways. 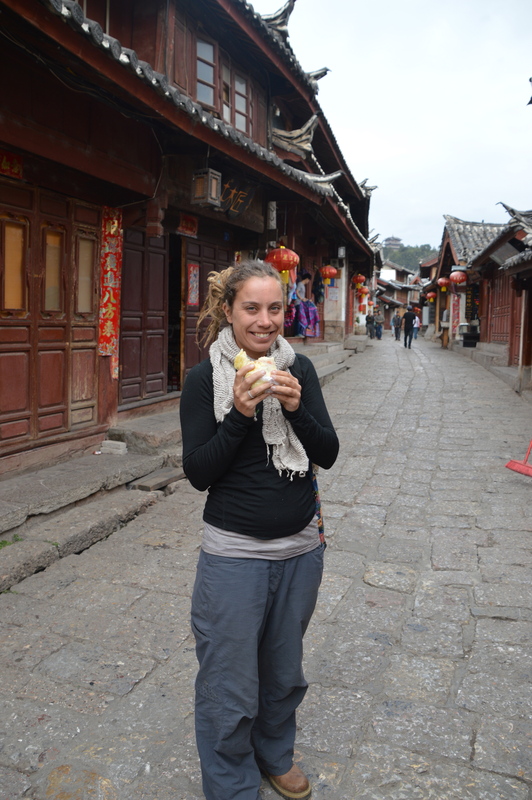 Enjoying street snacks in Lijiang. 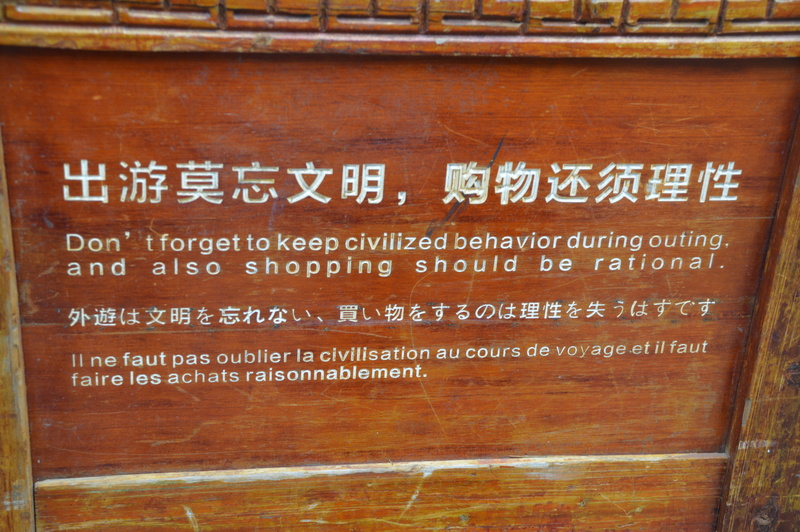 Remember that people, shopping should be rational. 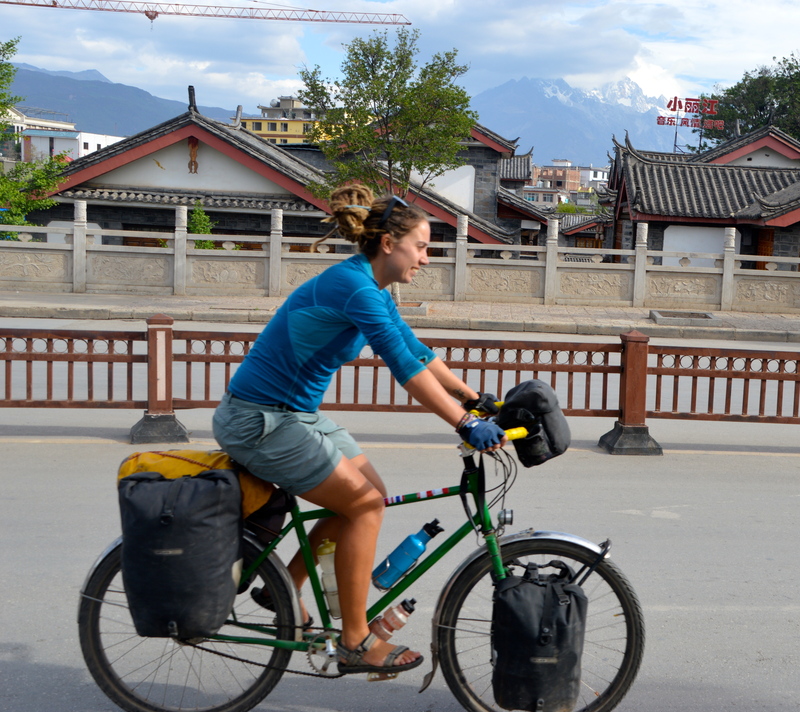 As Lijiang was swinging into its daily ritual, we waved it goodbye and cycled north towards the town of Shuhe. 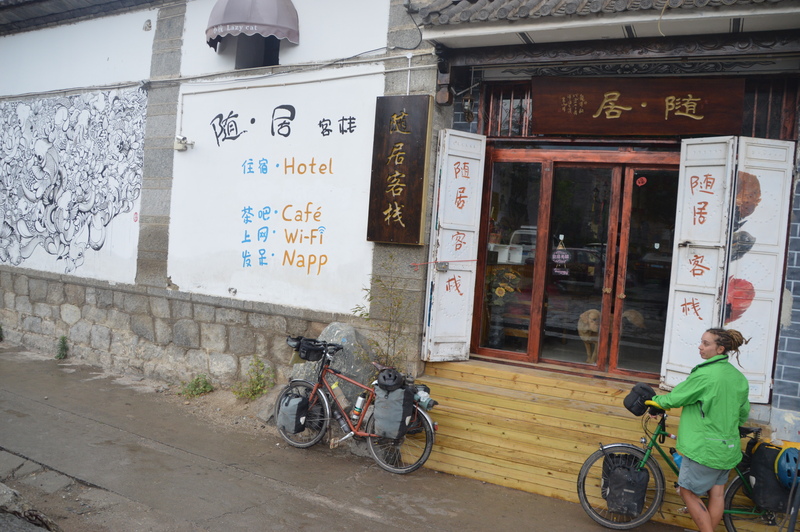 We had read that it was less full on than Lijiang and that there was a cafe/hotel there run by a dutch cycle tourist. 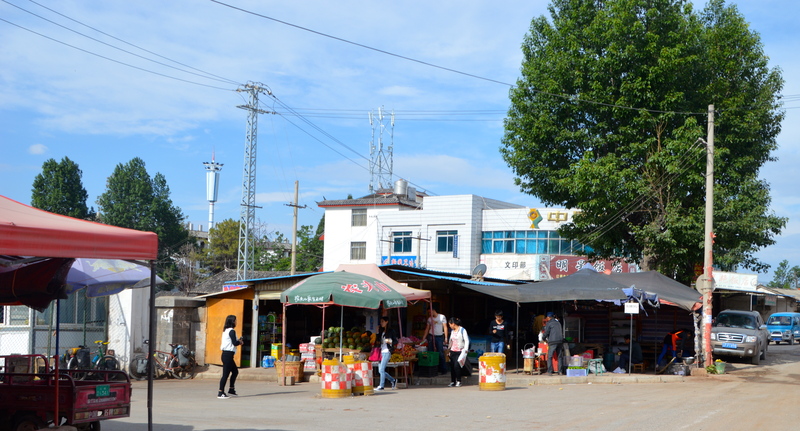 Having no internet access due to the incompetence of Chinese mobile phone providers, we rocked into town not knowing exactly where it was but thought finding the place would not be hard. Oh how wrong we were. We spent hours trying to find a place that no longer exists, so much for our rest day. 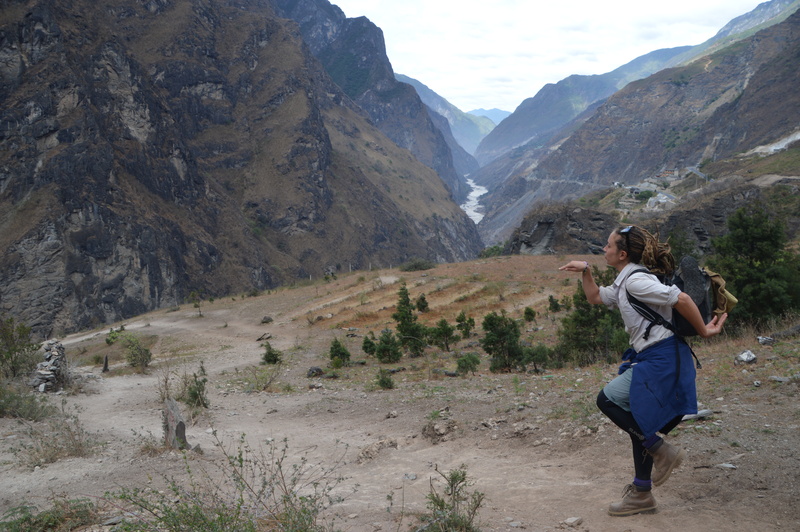 The chaos continued when our bank card no longer worked and I spent the next couple of hours cycling around trying to find a place that would accept our card so that we could buy dinner and pay for our adventure to Tiger Leaping Gorge the following day. Turns out we were the victims of credit card fraud and luckily our bank had picked it early. 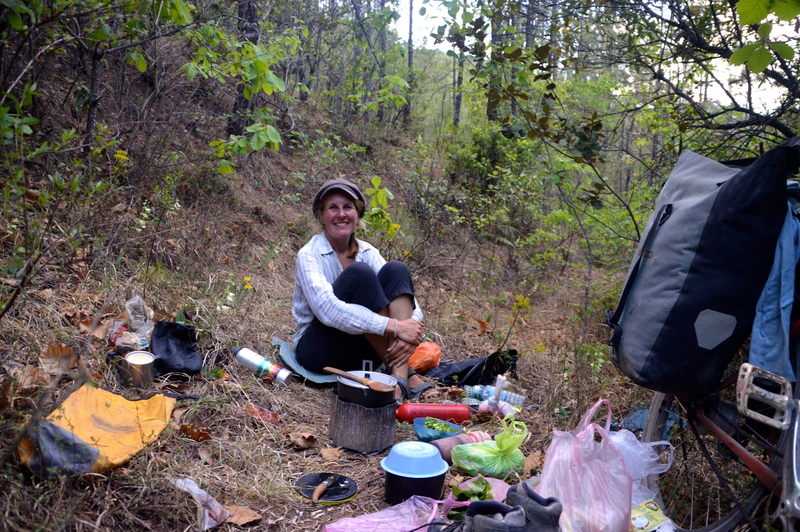 Luckily we had a back-up and as the full moon rose we treated ourselves to homemade pizza and banana cake. Tomorrow would be a better day. Quiet streets in the morning. 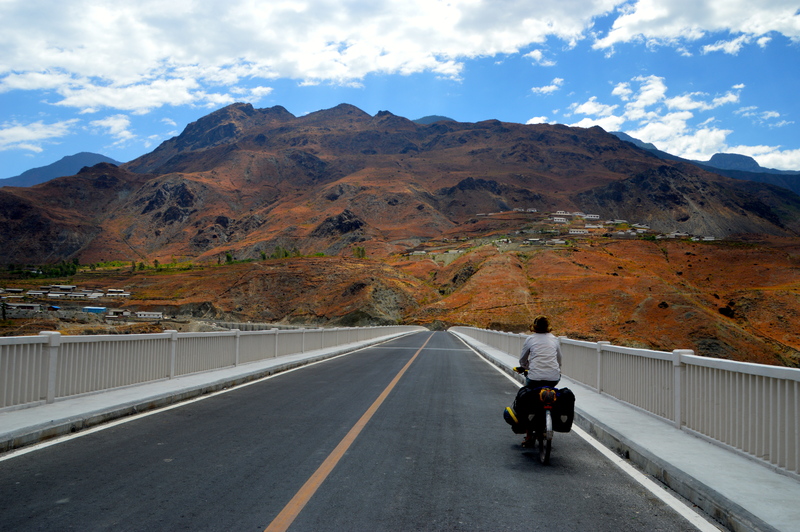 Towards Shuhe and some snow capped peaks. Where is the place we are looking for???? Our excitement was palpable when we woke. 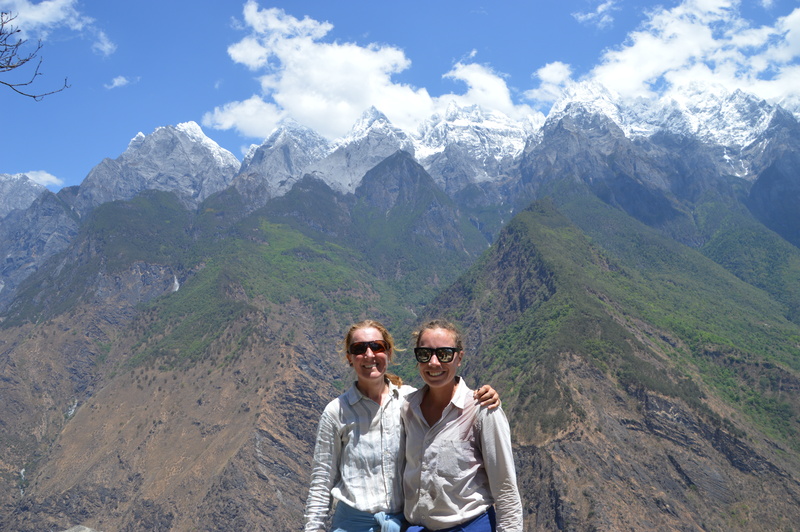 The ladies would have a rest while we headed off for some spectacular hiking in Tiger Leaping Gorge. The bus dropped us off at the trail head and we began our climb along the track that we would be following for the next two days. Words cannot do justice to how stunning the gorge is. 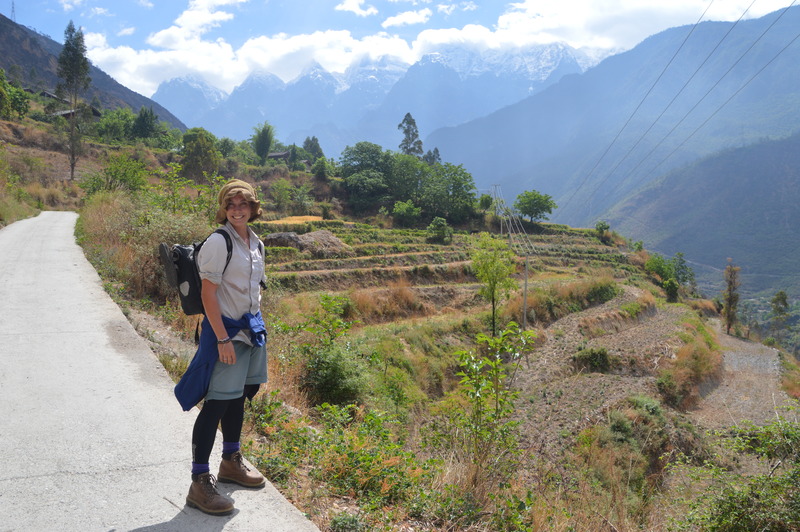 Every hundred metres we would stop and ogle at the surrounding mountains, the snow capped peaks, the Yangtze River pounding far below. It was intoxicating. 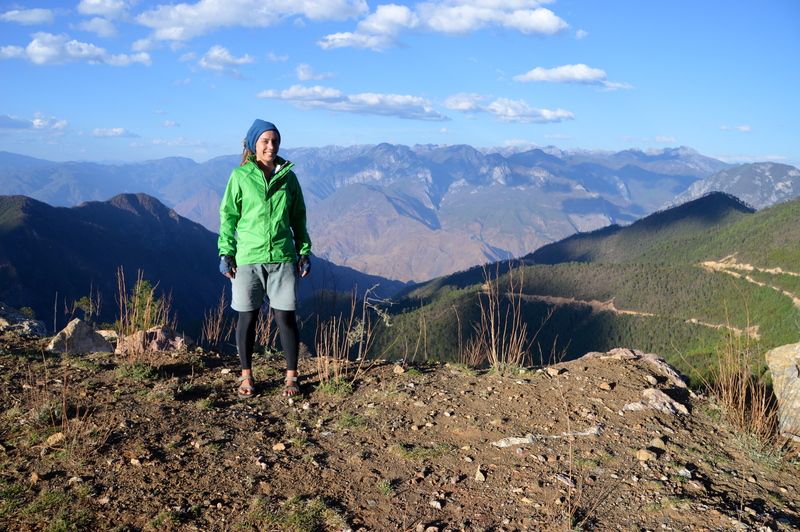 Banter was exchanged with other hikers on the track and we spurred each other on through the numerous switchbacks and on rest breaks we revelled in the beauty of the surrounds. Our room for the night had 270 degree views of the gorge and after a few celebratory beers and some dinner we lay in bed and watched the surrounding peaks disappear into darkness. 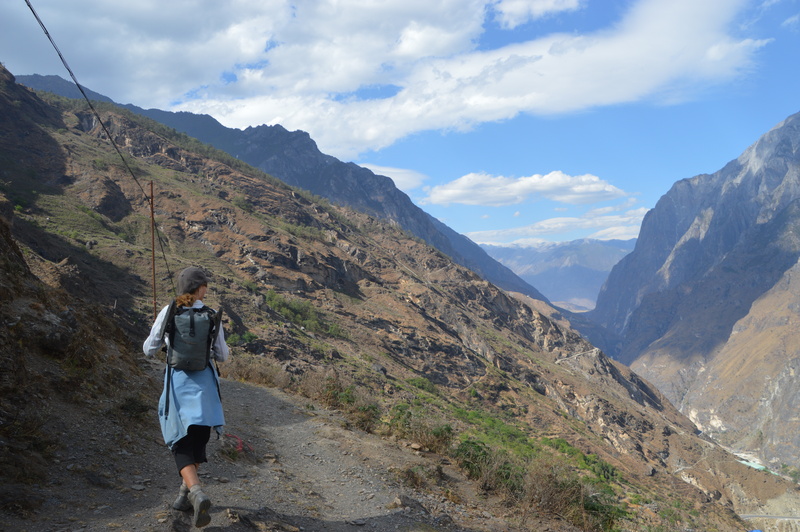 Trail head to Tiger Leaping Gorge. We stopped and ogled every hundred metres. Beauty and beauty, ha ha ha. 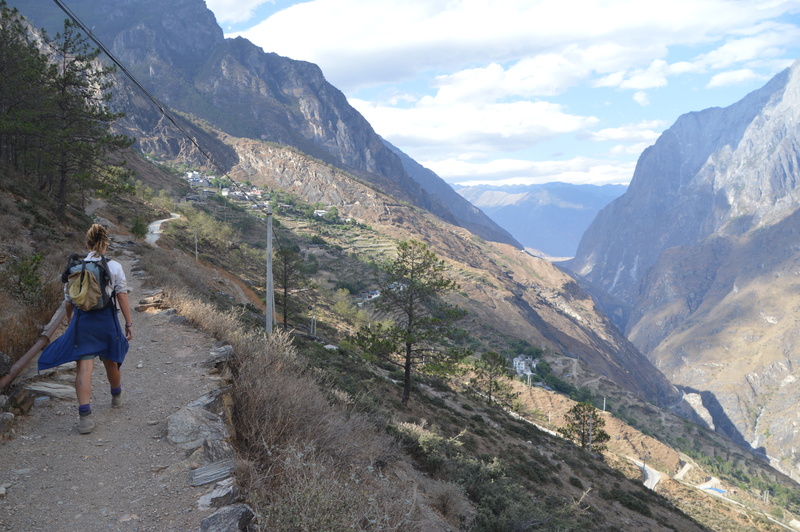 Looking down the gorge towards Shangri La. As first light coloured the sky we snuggled into our thick blankets and were grateful for our wonderful life. 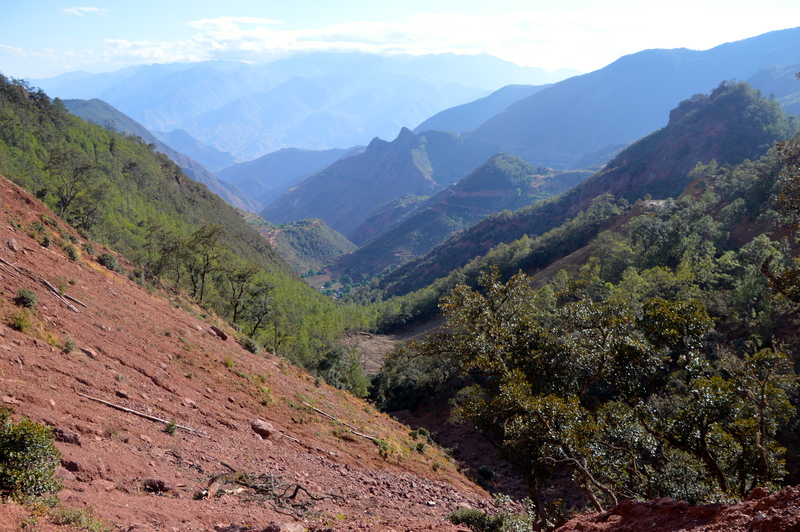 The clouds changed from pink to red and the 2000m cliff face opposite us loomed large in the morning light. We hit the path early catching the first rays of the sun as they peaked over the mountain tops. 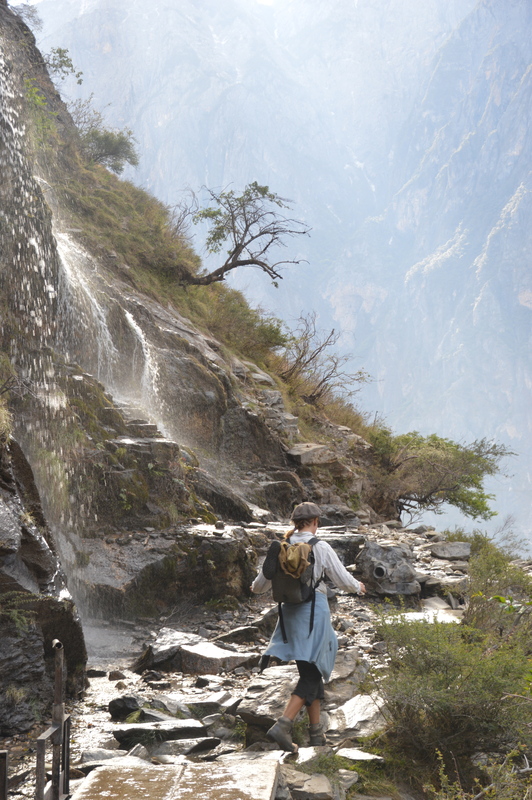 Passing shepherds with their goats and a handful of waterfalls, we soaked up the last few hours of high road hiking before heading down the 1600m pass to the Yangtze River. 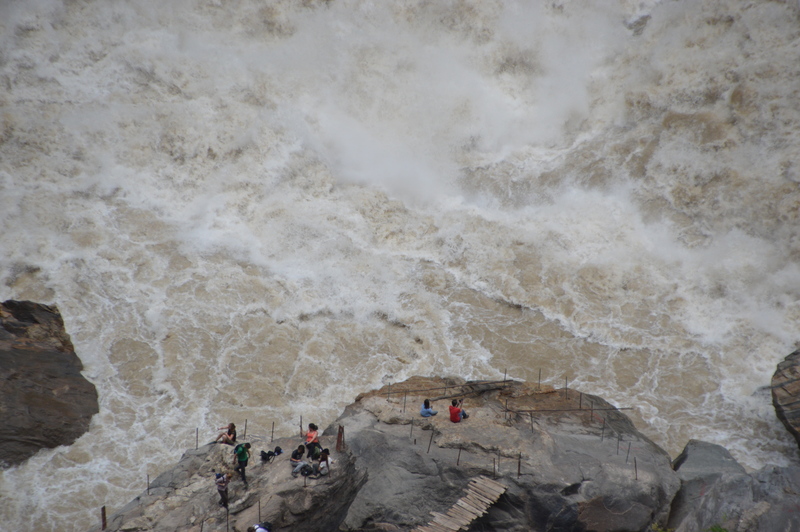 It churned and roared through the narrow gorge where legend has it a tiger leap to its safety over the river. The power of the area affected all our senses and we lost ourselves for a while. On the return hike we took a short cut up a ladder and I clung on for dear life refusing to look down until I reached the top. 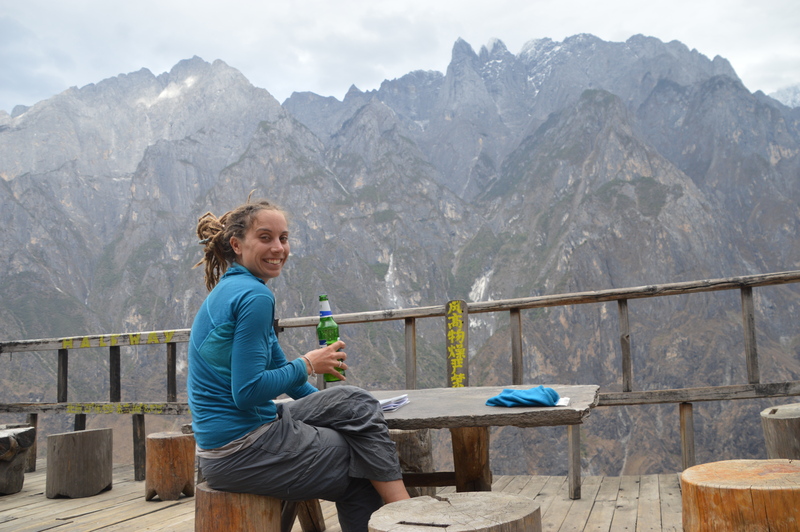 By late afternoon it was time to pile back on the bus to Shuhe and our hiking adventure was complete. As the sun set we walked through town with smiles on our faces and a glow in our hearts. 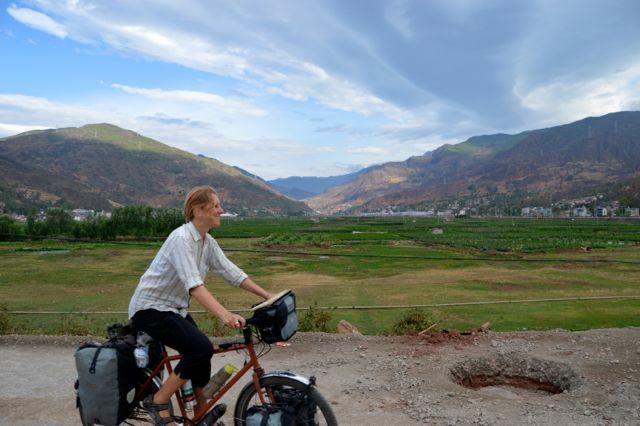 Tomorrow we would be back on the bikes cycling towards Lugu Lake, but tonight we would sleep and dream of snow capped mountains and tigers leaping. 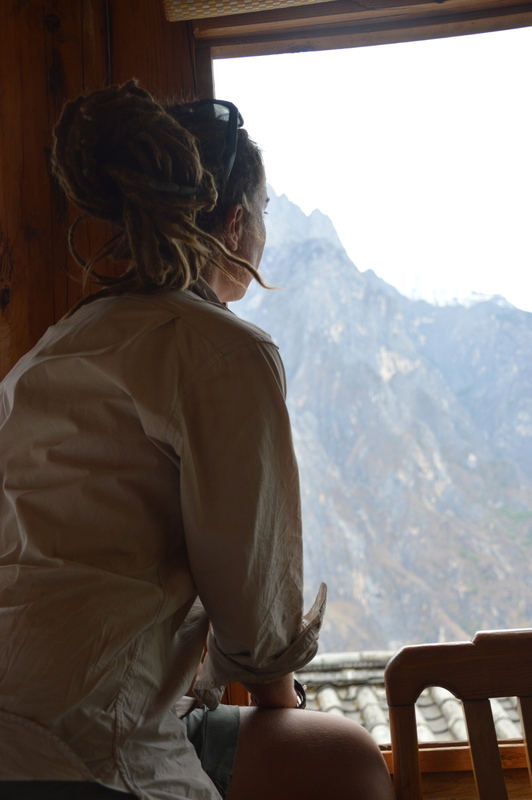 Jude looks over the mountains and the Yangtze. We would have just kept hiking. Jude is an animal whisperer. Inspired by thoughts of beer and dinner. Looking out of our bedroom window. Celebratory beer with a view. Our room overlooking the valley. 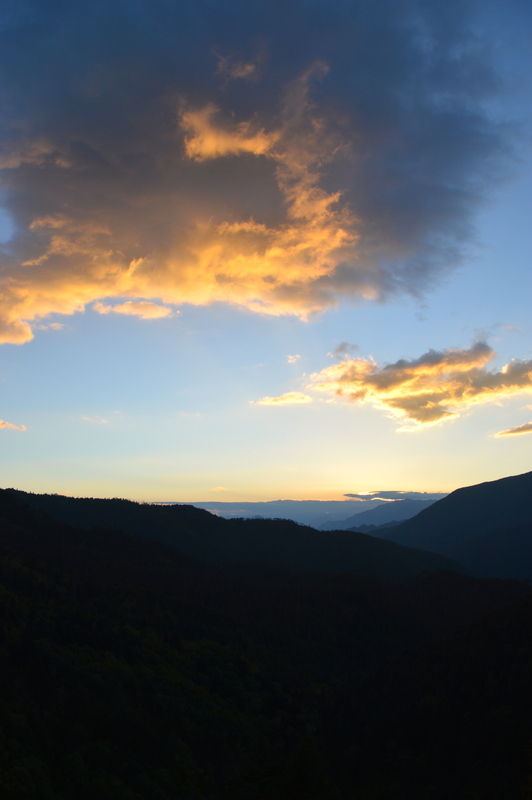 The sun’s first rays come over the mountains. 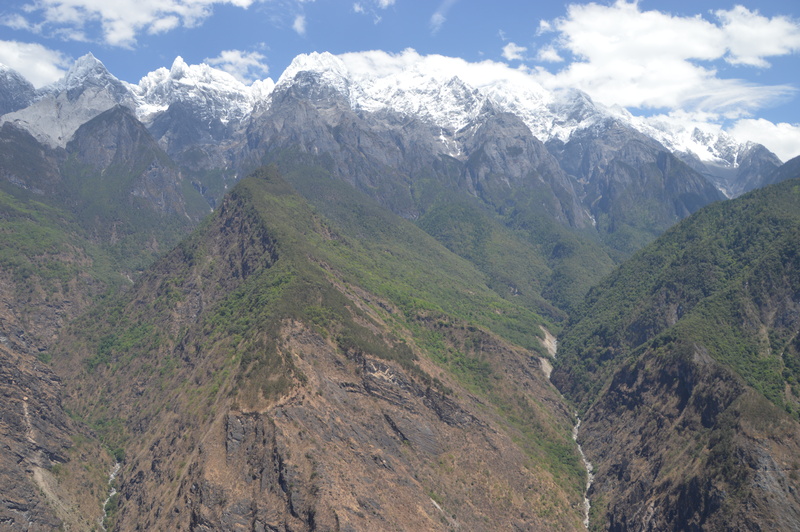 Bok bok at Tiger Leaping Gorge. 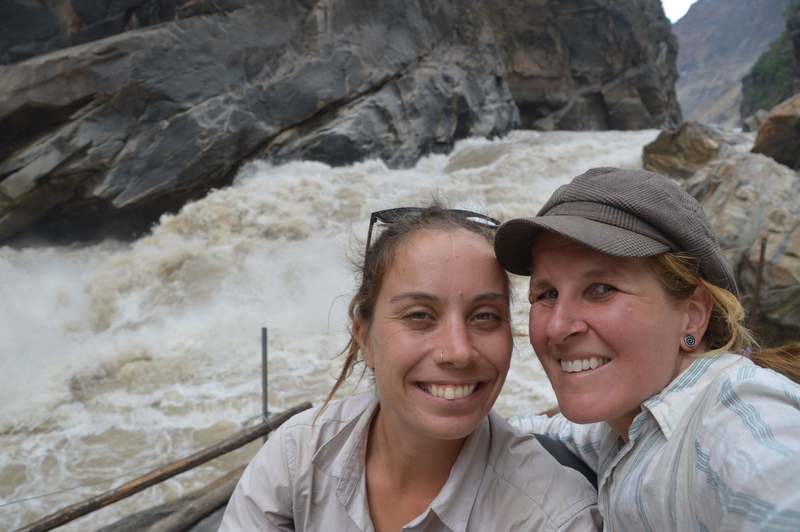 Down by the raging waters of the Yangtze. Climbing the ‘white knuckle inducing’ ladder. Feeling small next to such power. Locals keep donkeys to help tired tourists – if required. 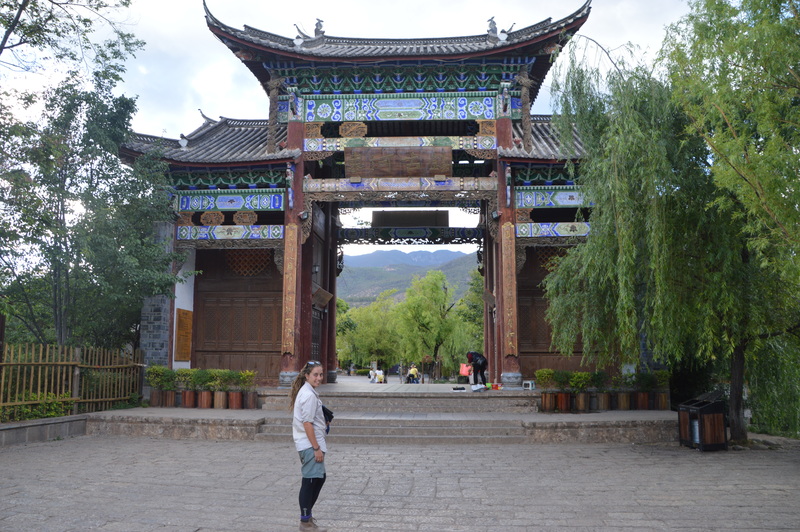 Back in Shuhe – tired but happy. 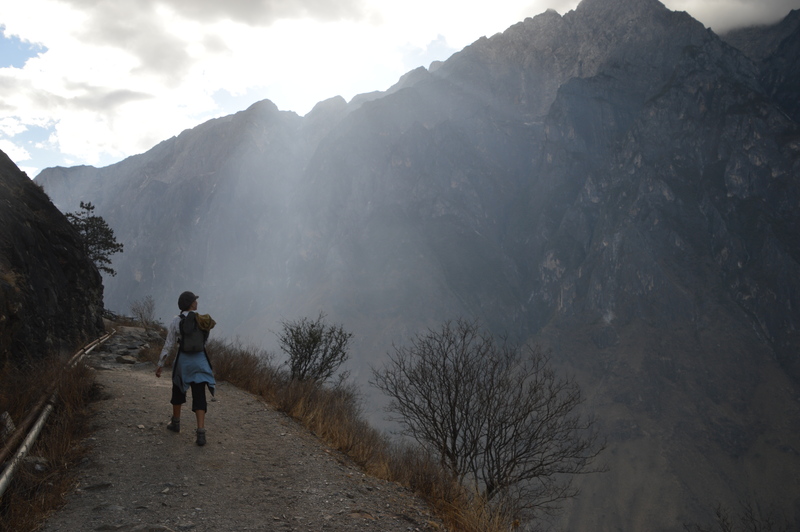 A stroll through Shuhe as the sun sets on another wonderful day. 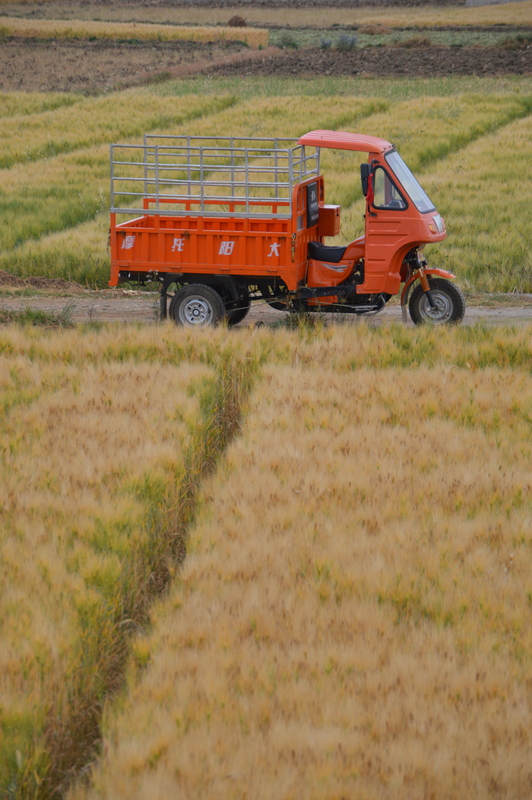 China – a land of contrasts. 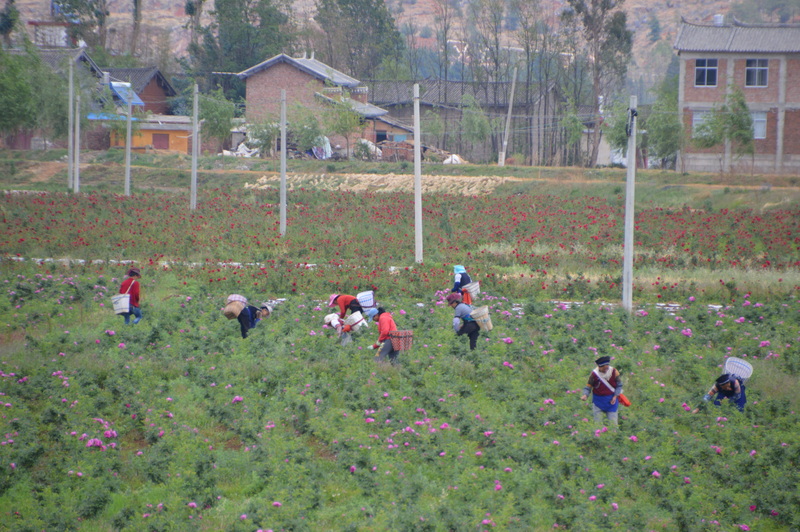 On the surface China is a dazzling, modern nation. Take the time to look a little deeper and a slower, more timeless world emerges. It is in one-minute familiar, the next a parallel universe that leaves you reeling and confused. It is hispters on i phones, neon colour, communal dancing in the public squares at night, shopping malls, Cannon toting tourists in buses and sleek freeways. 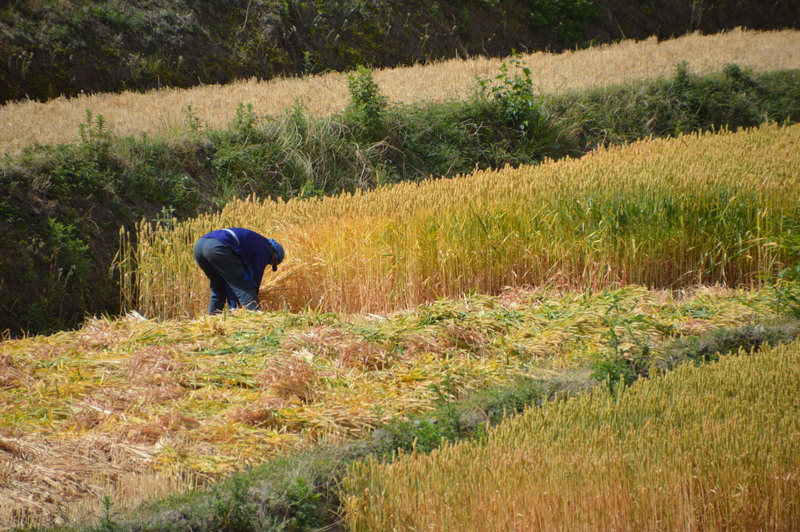 It is also a man ploughing the land with a buffalo, a woman tilling the land by hand, a goat herder on a remote mountain highway, cooking on open fires and villages only touched by the slightest hand of modernity. 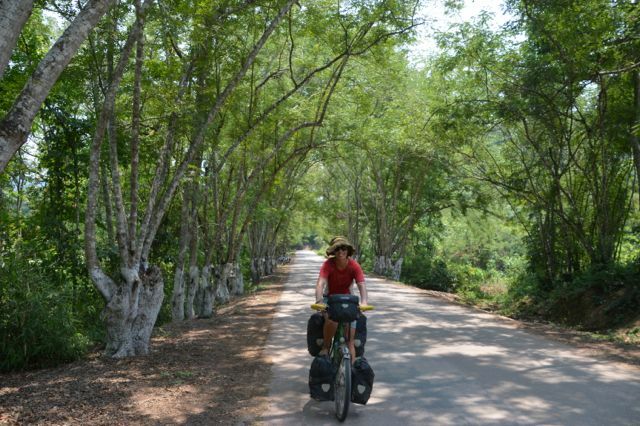 The first thing we noticed as we pedaled the small distance between the Laos border post and Chinese immigration was that the aim was to impress. And impress it did. Everything was state of the art and we passed through immigration without any issues. 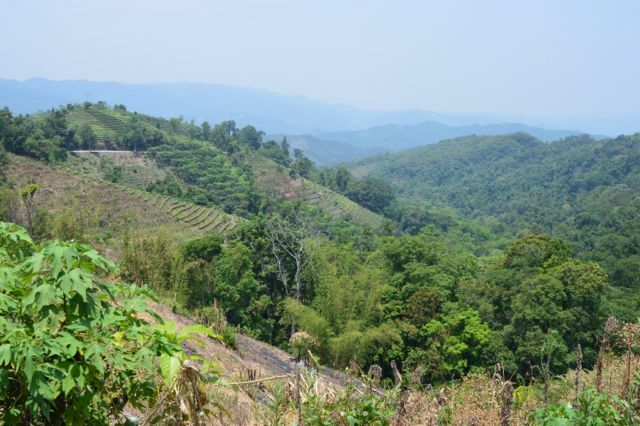 Mohan, the town on the other side was a world away from the dusty, small villages on the Lao side. 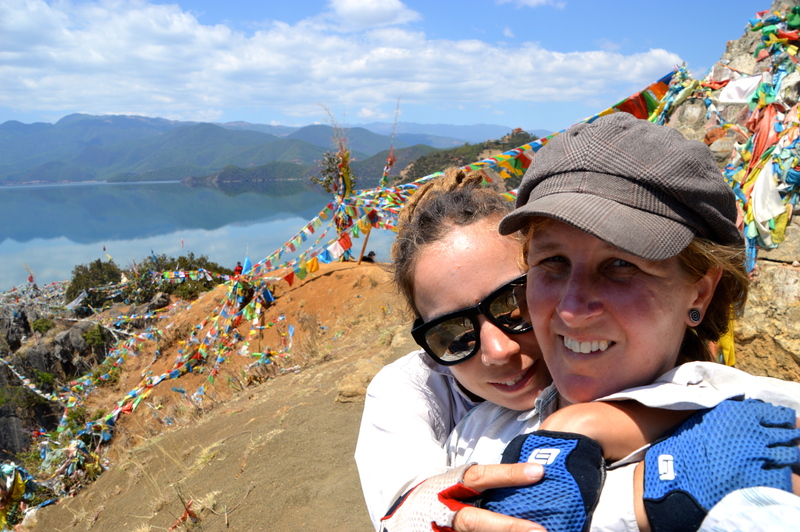 It was something of a reverse culture shock. We eyed the footpaths, tree lined streets and rubbish bins with suspicion. It was weird. A footpath that wasn’t a car/scooter parking space? 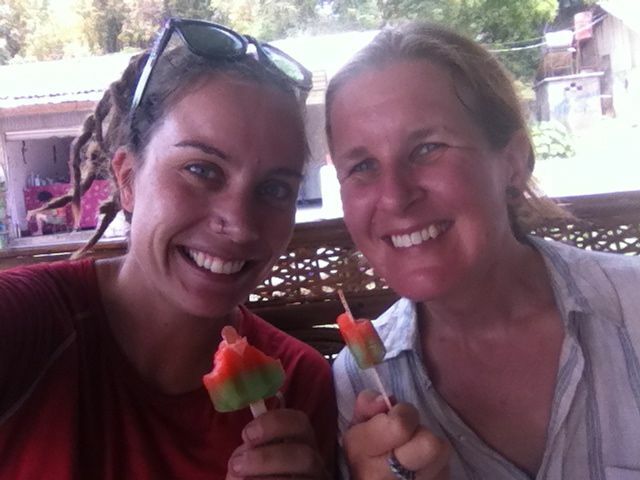 Recovering, we took care of the normal ‘we are in a new country’ tasks and bought a sim card and exchanged the rest of our money. Soon we were sailing along a smooth new highway with a wide shoulder, but being us we couldn’t resist the small, shaded road we kept seeing to our right. Checking the phone we found that this ‘old highway’ the G213 in fact ran parallel to the new road. A few kilometres further along we met a Malaysian cycle tourists who gave us the good news that this road continued on our planned route for a good long while. So here we were, on a shaded road with barely a car in site, passing through the odd village, things couldn’t have been better. Well, until we found milk tea in a bottle that is. Delicious. 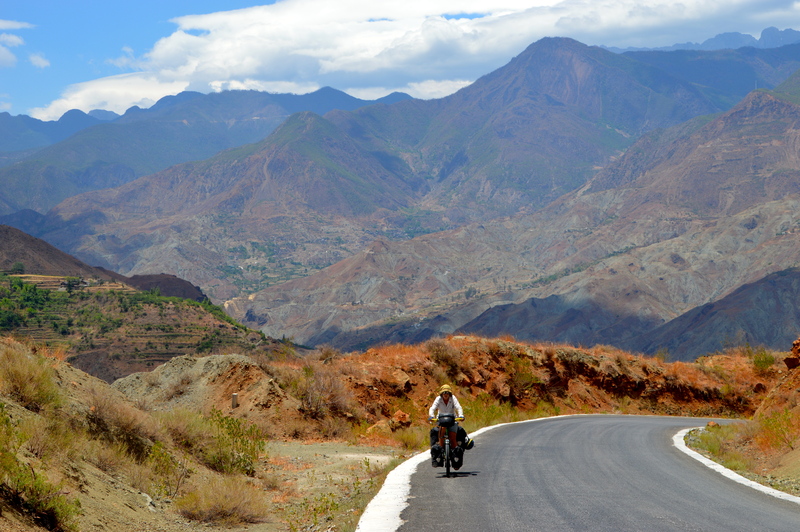 We took it slowly and reached our first destination of Mengla around 4pm. Again we were a little culture shocked; it was huge (by our current standards), bustling, shiny and modern. Friends had told us that ‘look for places with clocks behind a desk’ because they are bound to be hotels (there is very little English writing). This proved to be useful and after not much fuss at all we were checked into our first Chinese hotel. By our standards, this $10 room was pretty fancy. We were to learn that Chinese hotels can be excellent value. Often from $8-$12 you get a light, clean, airy room with hot water, TV (never use this), aircon (most of the time), and a kettle (the best!). Eager to explore this new country we were soon walking around checking out the sites. People stared and giggled at us and we saw no other foreigners. 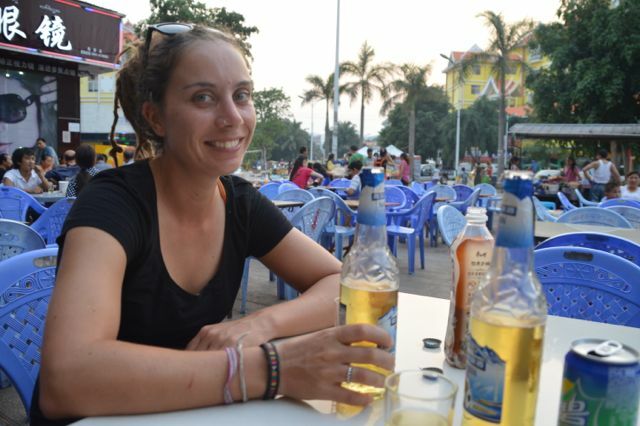 We did find amazing street food and then wandered around until we found somewhere to observe life go by and have a beer. From where we sat, the China we could see looked overwhelmingly middle class. Families out to dinner, groups of teenagers on smart phones, shops full of goods and electronics. 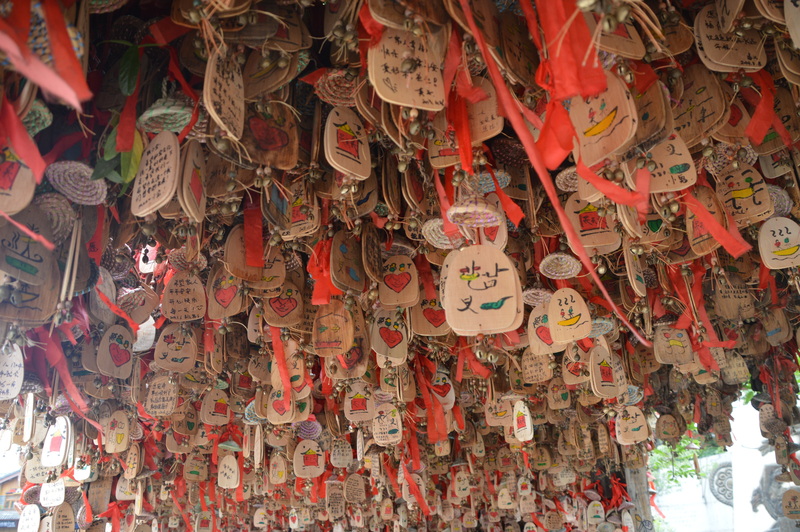 It could have been the west, were it not for all the Chinese characters and the people themselves. Oh and the middle aged ladies all dancing in lines to Chinese pop music in the public squares on the way home. 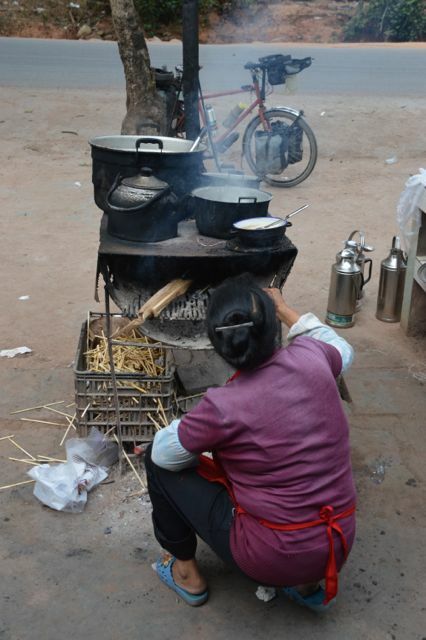 A different China – side of the road soup – delicious! 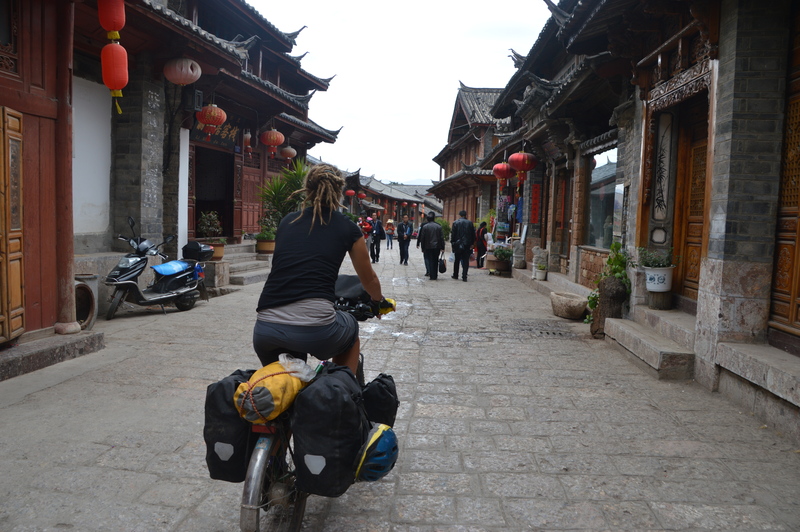 It did not take long for us to see a different China the next day as we pedalled out of town. 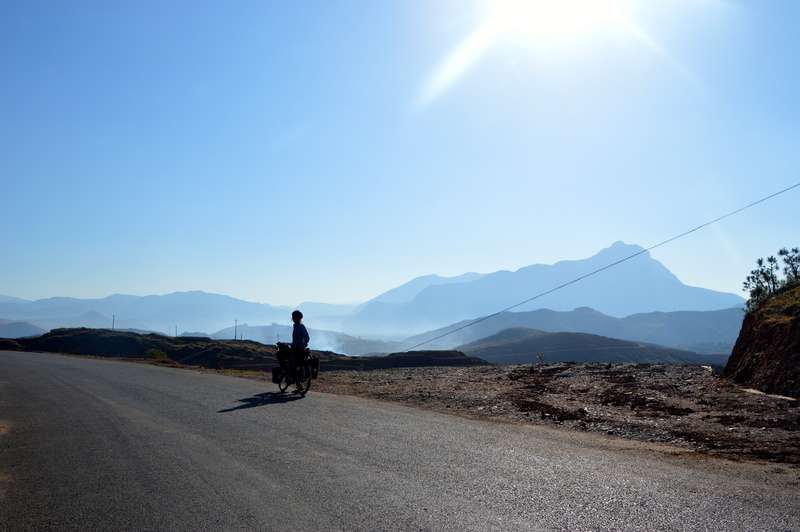 The villages and farmland outside of Mengla was a world away from the modern city we had seen the night before. 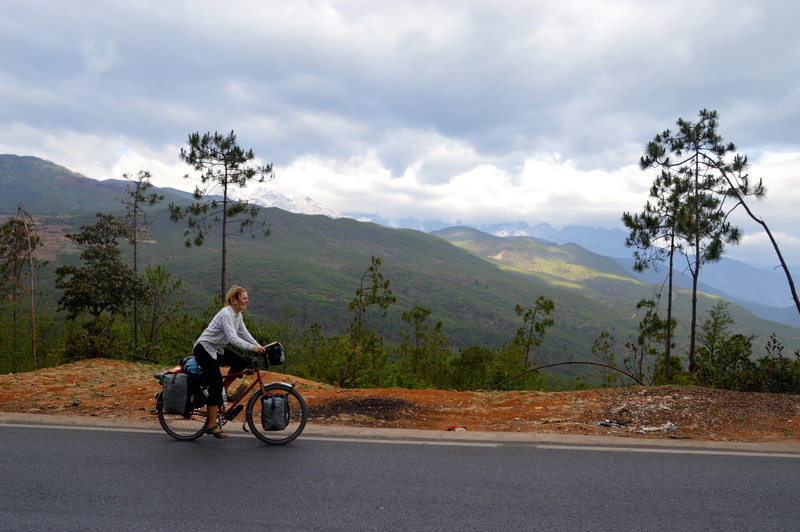 The cycling was beautiful, but really, we would have achieved more if we had stayed in bed all day and watched Spooks. 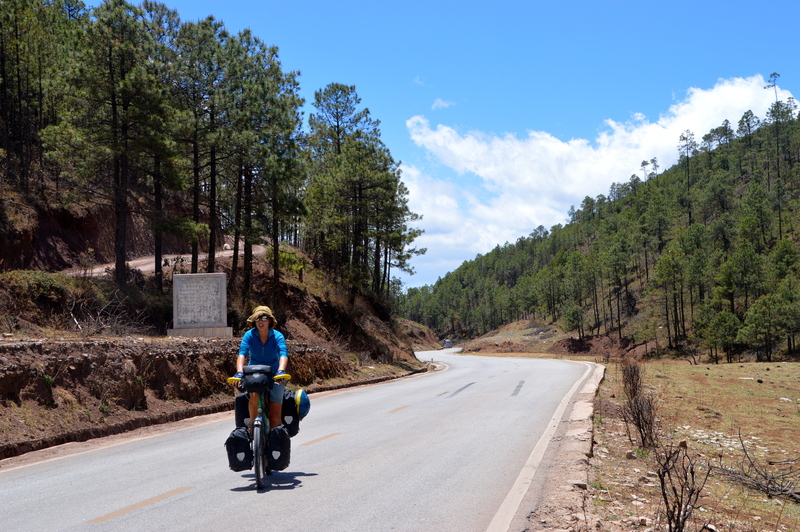 Unfortunately we had a severe navigational fail (trying to take a short cut), which culminated in an argument half way up an impossibly (we were pushing our bikes) steep dirt track where we made the decision to turn around. 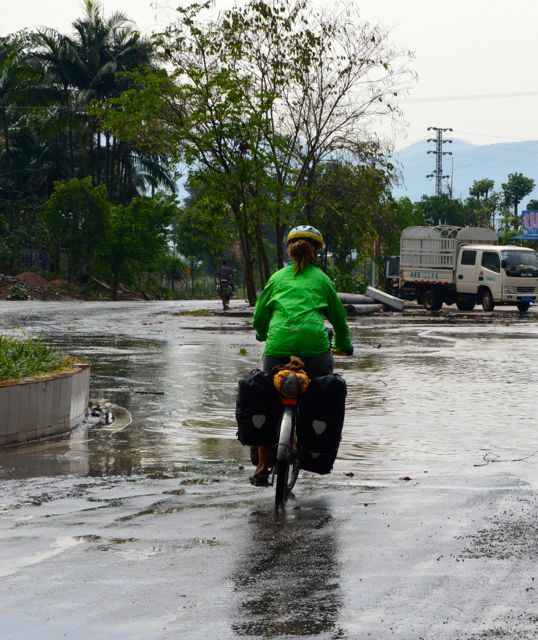 To top it off, on the way back we were caught in a severe rainstorm and rolled back into Mengla after 90km completely saturated, exhausted and a bit dispirited. We have bloody gone the wrong way! 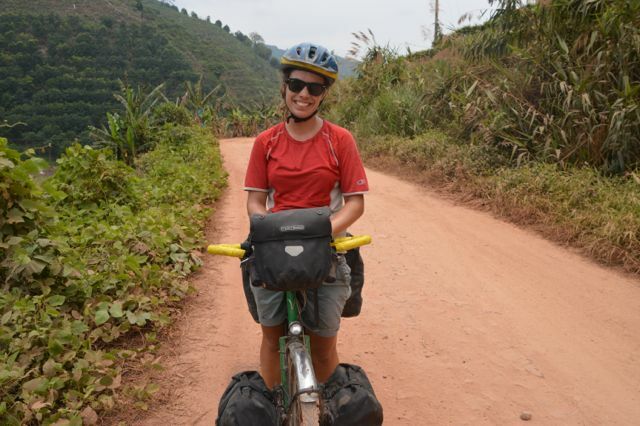 For some reason I look remarkably happy for someone who is about to cycle 45km back the same way! I was NOT happy at all. A storm is on it’s way..
Take two. The next day, feeling a bit shattered we made sure to take the correct G213 and ignored the apparent shortcuts. The road was a dream. Undulating through forest, cool and damp from the previous days rain. 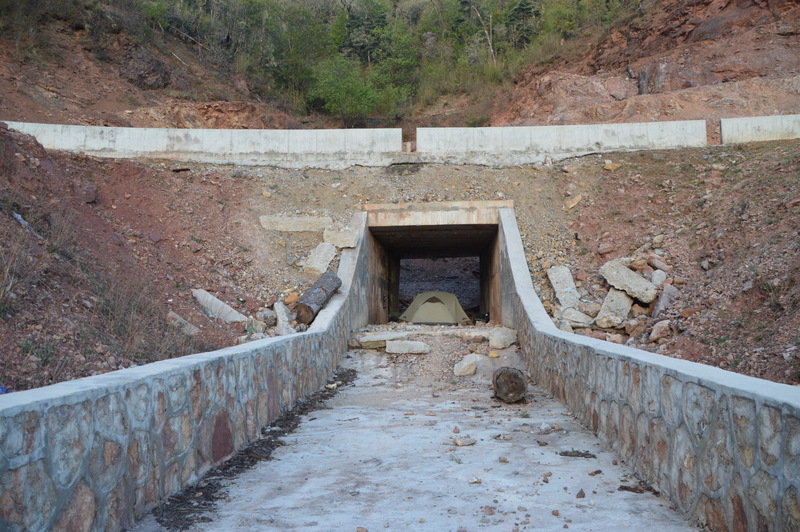 We had glimpses of the new highway below on our right but barely saw a vehicle ourselves. For lunch we happened upon some noodle stalls and after some shy staring worked up the courage to see what it was all about. 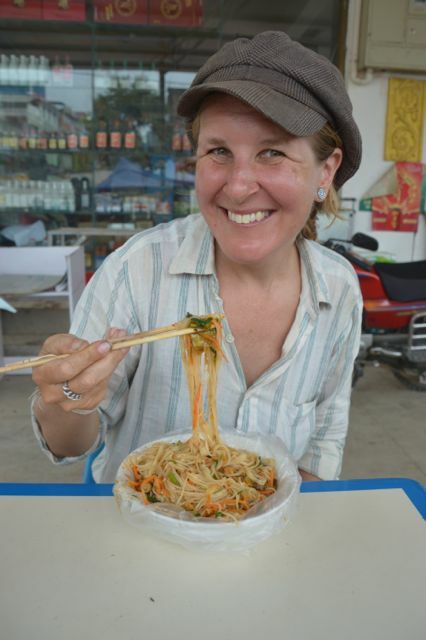 We were rewarded with a delicious noodle salad kind of thing. 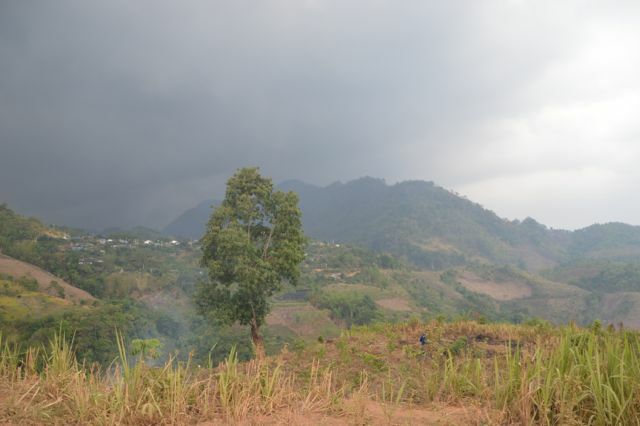 In the afternoon the rain pelted down again, but by the time we reached Menglum it had cleared. A quick search and another cheap hotel opened up its doors to us. The power was out in town for a while, which added to the atmosphere as we ate our street side noodles by candlelight. Some men nearby invited us for a drink and we shared some kind of hideous spirit with them. I don’t think I have tasted something so disgusting in all my life! Some kind of noodle thing is being prepared.. Climbing greeted us the next day and it pretty much continued all morning. 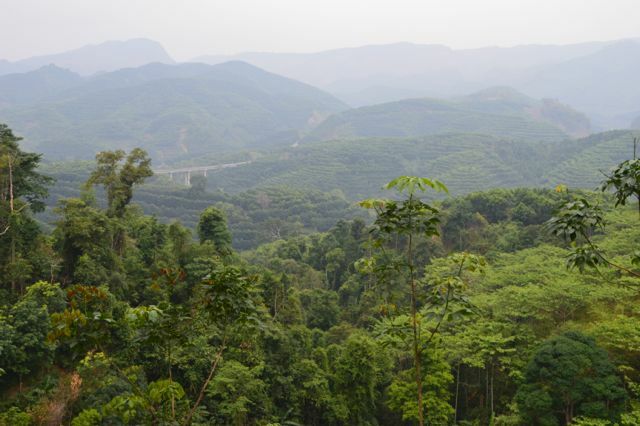 We began to get glimpses of the tea plantations and had some sweeping views of the valley below. The afternoon again brought a ferocious thunderstorm and we sheltered in someone’s garden with some men until passed. 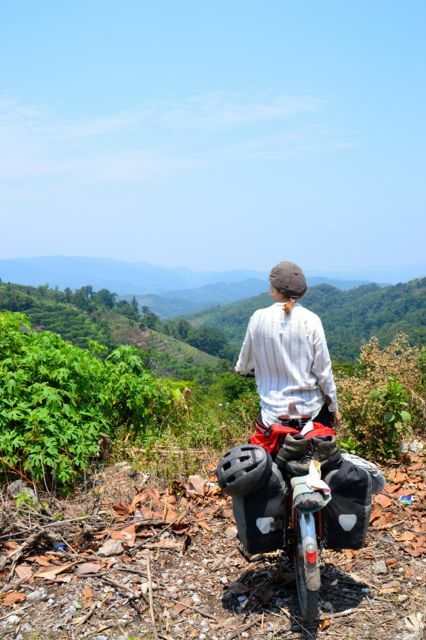 The day seemed to be slipping from us but somehow we managed to do 54km after 4pm, including 15km of climbing through tea plantations in the fading light. By the time we rolled into the small village it was dark and cold. Looking a little lost I imagine, we were spotted by an entrepreneurial woman who ushered us into her hotel. We gladly accepted. 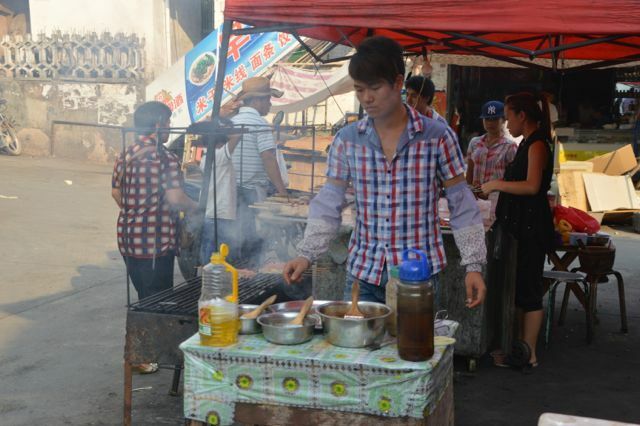 Walking out onto the street for dinner we were relieved to see the usual wok for noodles and ‘things on sticks stand’. By now we had figured out that we are in fact like giant, useless babies. That is, we can’t read anything and can only purchase food we see in front of us, or if there are pictures on the menus. By the next day we were really tired. The hammocks of Laos seemed a long time ago. It was also strange not being hot, as we had to layer up for the decent. 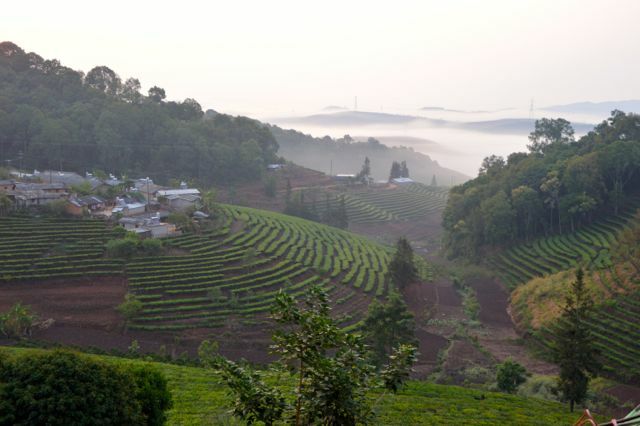 And descend we did, through a heavy mist with tea plantations on either side of us. 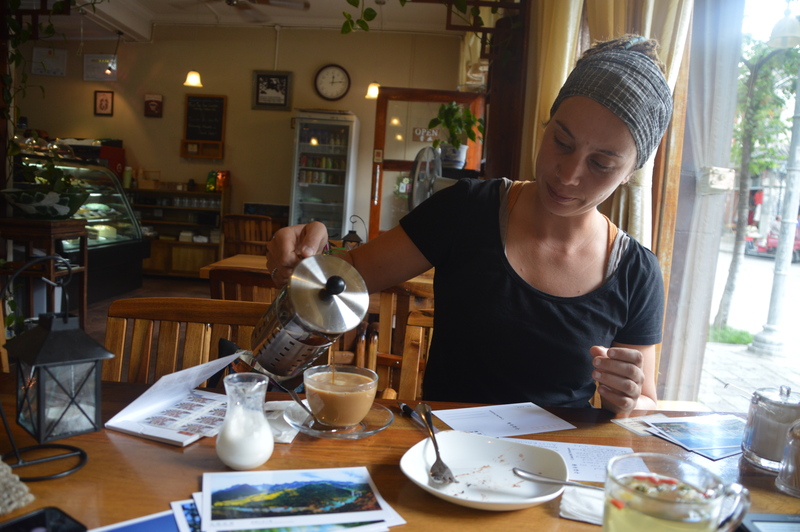 Unfortunately no teahouses eventuated, we would have loved nothing better than a hot cup of tea! By mid morning the sun was out and we were climbing again. 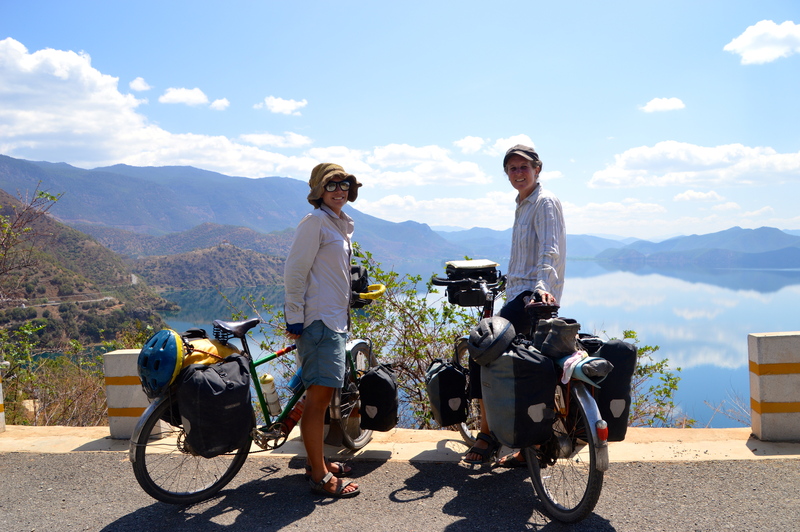 To our delight we met two cycle tourists within about 500m of each other. A Japanese guy, carrying what looked like almost his entire house (including undies drying on his handle bars) and an enthusiastic Chinese guy who snapped photos of us and chatted away in Mandarin. 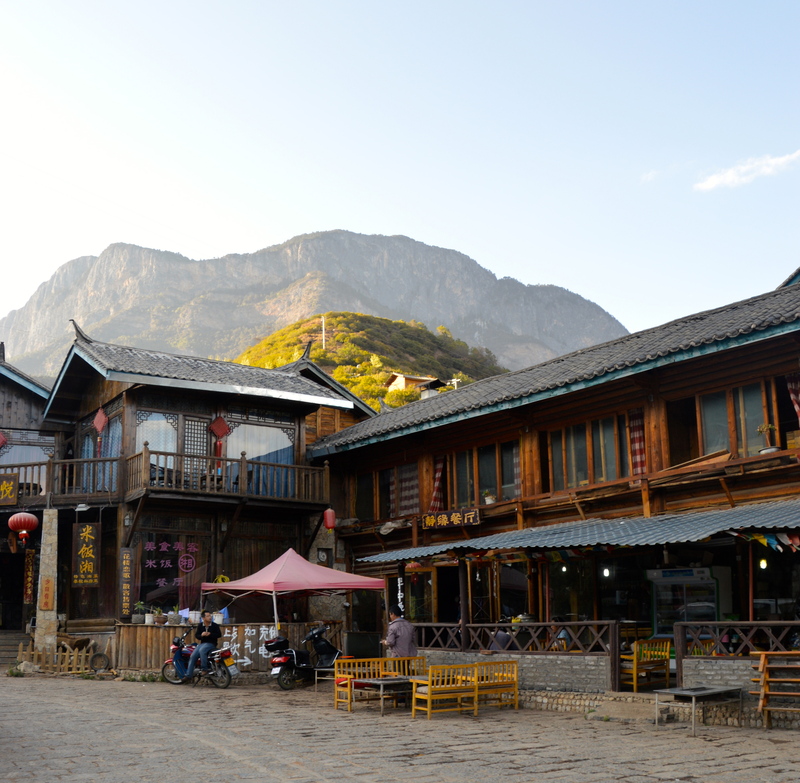 By early afternoon we had reached Pu’er, the town we decided to have our first rest day in. It was a huge mass of seemingly unending mobile phone shops and we had trouble finding a hotel at first. 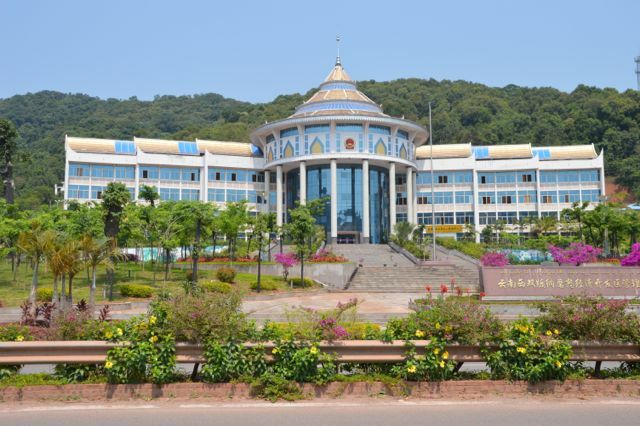 When we did find one, the woman behind the desk became flabbergasted by our Australian passports (some hotels in China cannot accept foreigners, or don’t know how to register them properly. I suspect our problem was the latter). 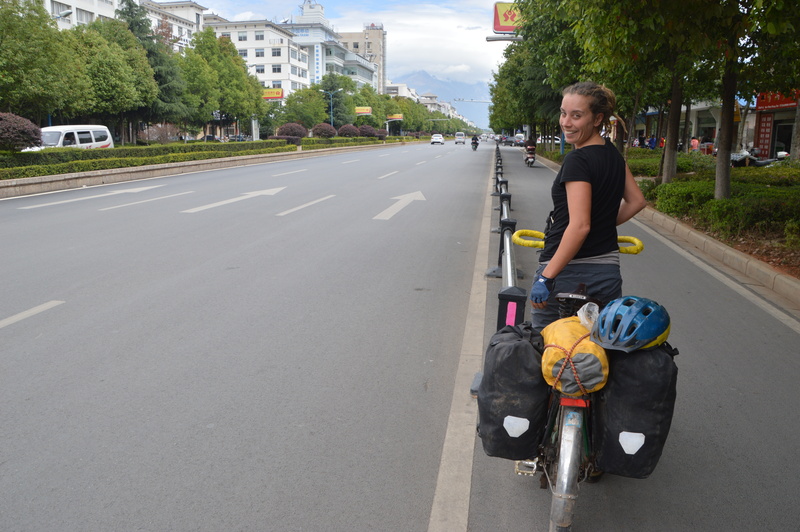 We were made to reload our bikes, marched to the most expensive hotel in town and then promptly abandoned. Sitting outside this shining monstrosity, dirty, tired and having no idea where to find an affordable hotel that would take us, things seemed a bit overwhelming and bleak. However, if there is one thing I have learnt on this adventure, it is that things always turn out okay somehow. We were not disappointed. A very kind English speaking lady from the expensive hotel came to our aid, not only taking us to a cheap hotel but also making sure we were checked in correctly by the staff. What a sweetheart. It was not the last time we were to be rescued in this fashion by the kind Chinese. Vegie steam bun, the breakfast of champions. Pretty happy with this $10 room. Our room was amazing. We spent the next day and a half drinking tea, watching Spooks, reading, writing and generally recovering from 7 days of cycling. 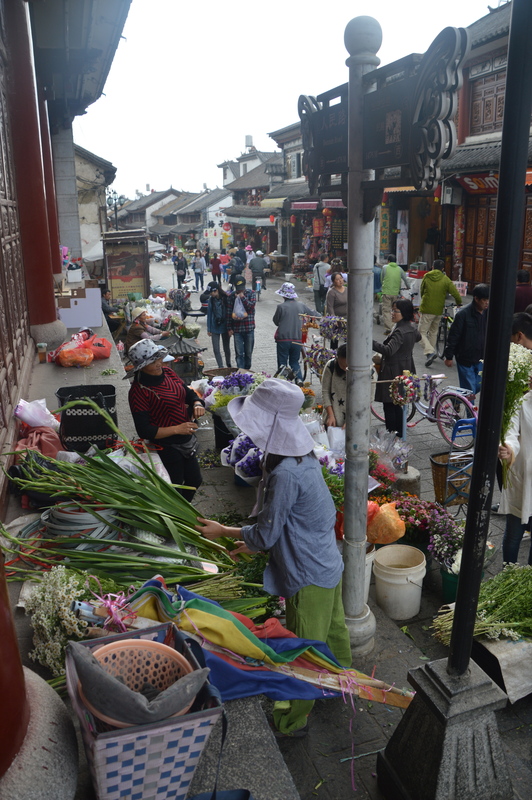 We did venture out into Pu’er but there was not really much to see, mainly just mobile phone shops. 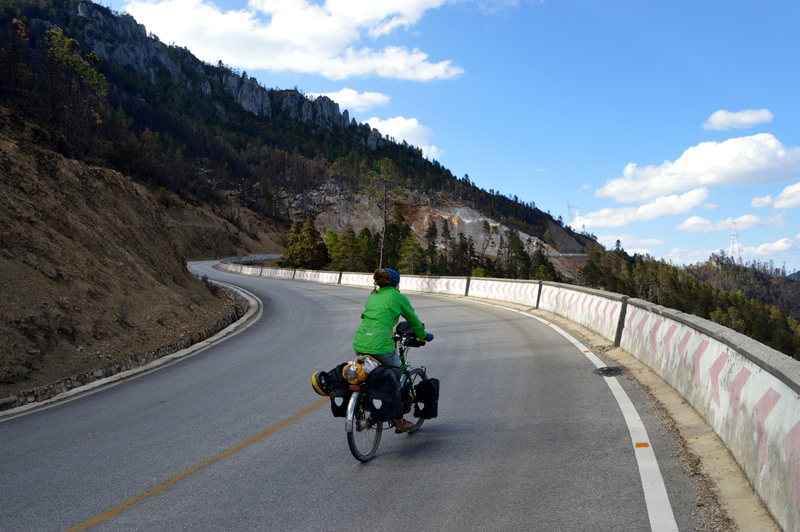 Back on the road after our rest day we met some Chinese cyclists on the first ascent. 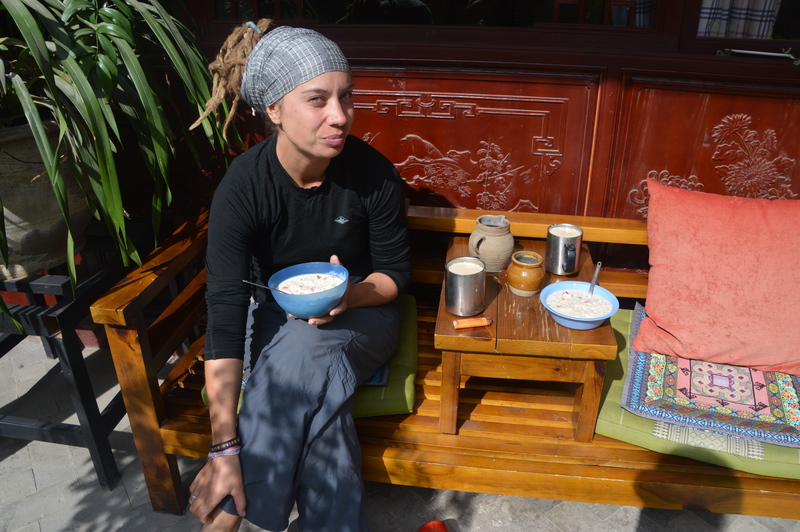 They invited us for tea and then looked rather alarmed when we showed them our planned route to Dali. We were promptly told our map was too old and then drawn and shown a better route. They soon sped off on their mountain bikes and we continued our slow plod up the hill. 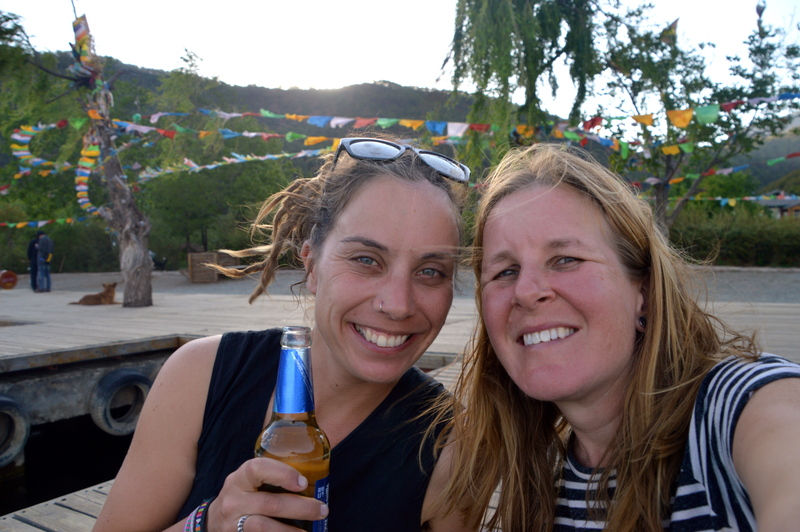 That night was spent in a kind of truck stop and we watched the sunset over the surrounding mountains while drinking a beer and listening to a lady belt out some fine Chinese pop tunes. 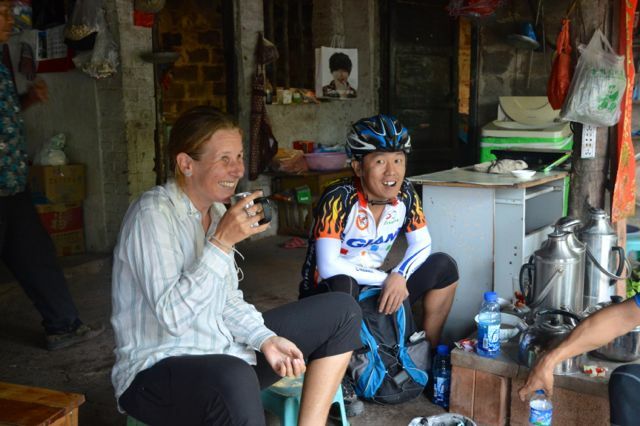 Tea with the Chinese cyclists on top of the climb out of Pu’er. Ah, too much texting perhaps? 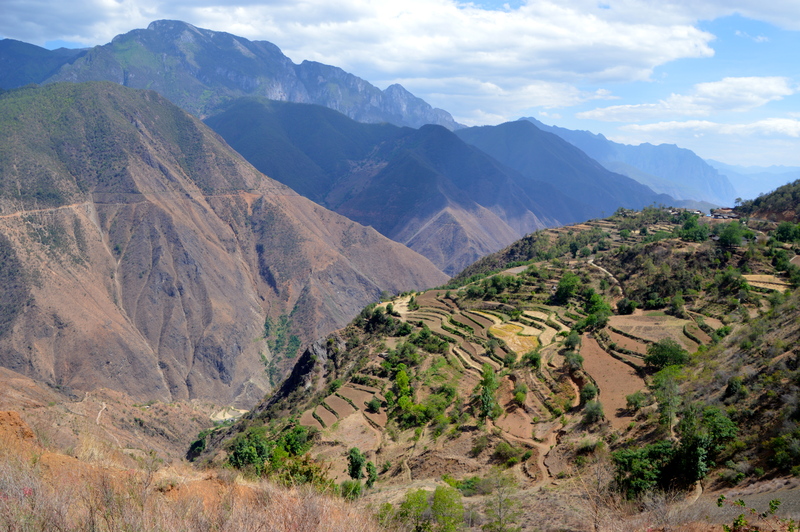 The next 3 days involved climbing over mountains and then descending into vast valleys, where every inch of the ground appeared to be farmed. 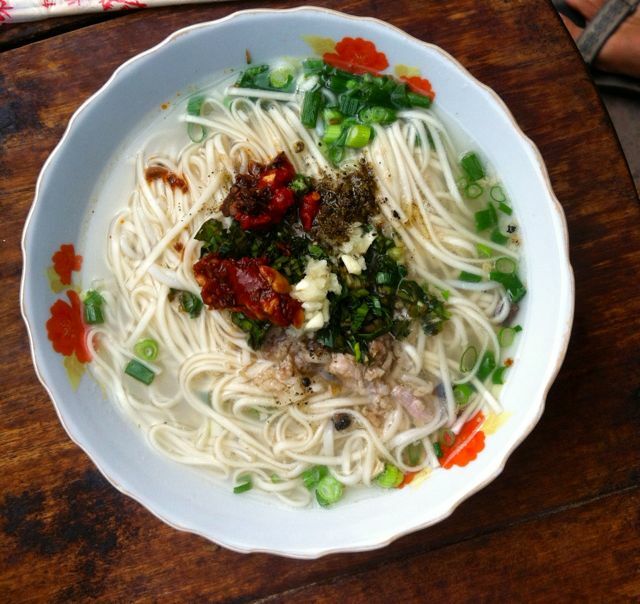 We passed through small villages, where the locals found us quite a curiosity and we found the noodle soup to be quite delicious. 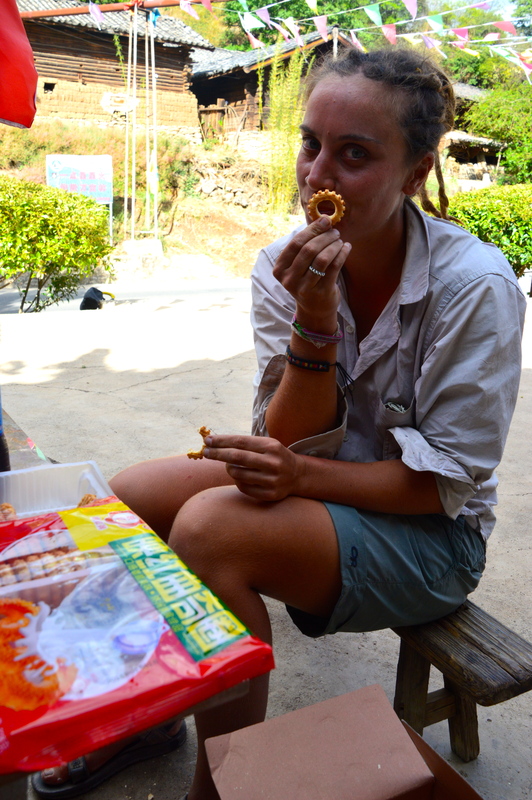 For snack breaks we ate mountains of Chinese sponge cake (a new discovery) and drank milk tea from a bottle. 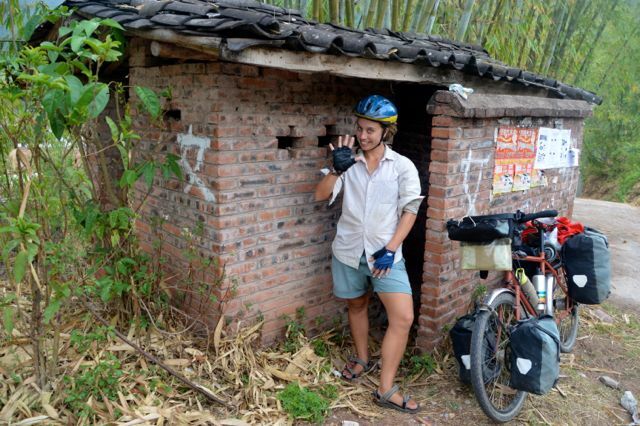 We learnt about the infamous Chinese toilets (yep, they’re as bad as everyone says they are) and spent our nights in small Chinese cities. One night we were confronted with not being able to eat on the street and were shown a giant fridge full of produce in a restaurant. Confused, we pointed vaguely to a few items, vegetables? We tried to look up the mandarin for it, but of course, the phone was dead. Hmm, the Giant babies were faced with a new obstacle. After a few minutes of everyone being rather confused, we figured out that you point to whatever item you want (eggplant, tofu, egg) and they make one dish out of it and serve it alongside rice. Now we could even eat in restaurants without pictures! This public toilet gets 5/10. Not too bad. Lots of up and down! We bought these berries on the side of the road one day, then found them free to pick a few days later. 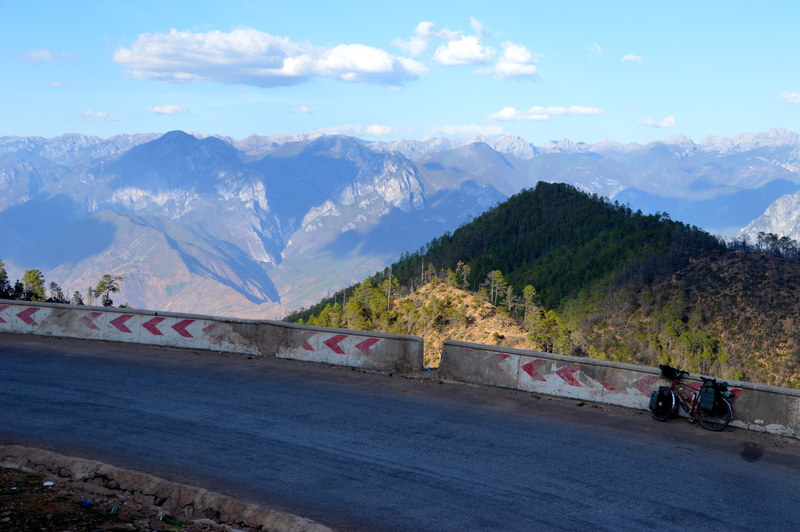 Late on the third day, we rolled into Dali. Despite feeling like any elevation we had gained had been promptly lost by a long down hills we had encountered, we were in fact now at 1900m. 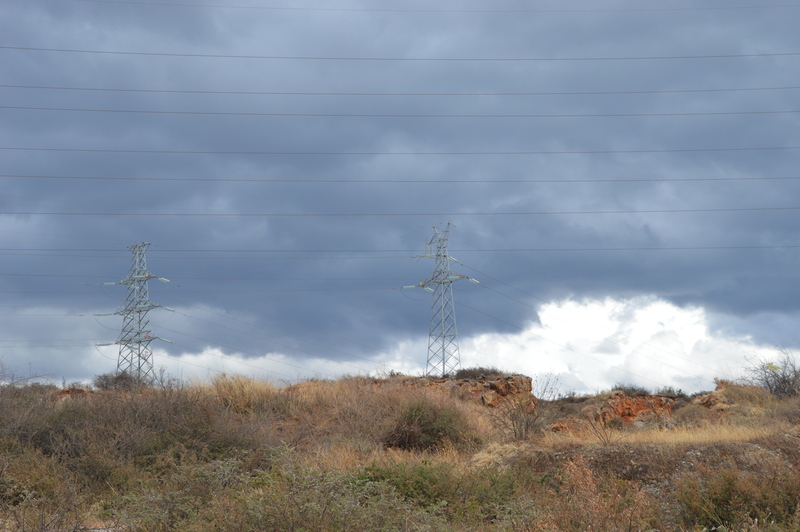 It was a little chilly, and clouds hung low and heavy over the surrounding mountains. 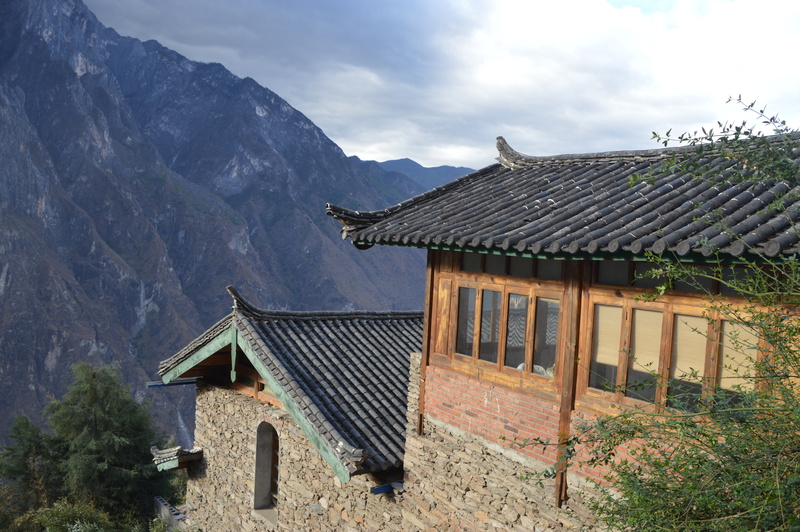 We found the most gorgeous hotel just outside the east gate. Then, hand in hand we walked the darkening streets of the old town, observing the tourists (mainly Chinese), street vendors, trendy bars, café’s and beautiful architecture. A rest day stretched before us, we were tired but happy.